Here is the record of the squares that will form my masterpiece blanket (do take a look at this link if you want to know more about the project). The most recent appear first. Unless indicated, they were made by me. By-the-way, if you’ve enjoyed my blog and want to contribute a square, do get in touch! You can see lots of other pictures relating to the project on my Masterpiece Pinterest board. 15 April 2014. Knitted leaves from The Twisted Yarn. Made from an alpaca-wool blend, these beautiful leaves represent the outdoors. The design is even charted out for me so that I can reproduce it myself – how brilliant is that? Glorious sunshine added to the challenge of getting a good photograph, but you can see a better one here that The twisted Yarn took herself. April 2014. 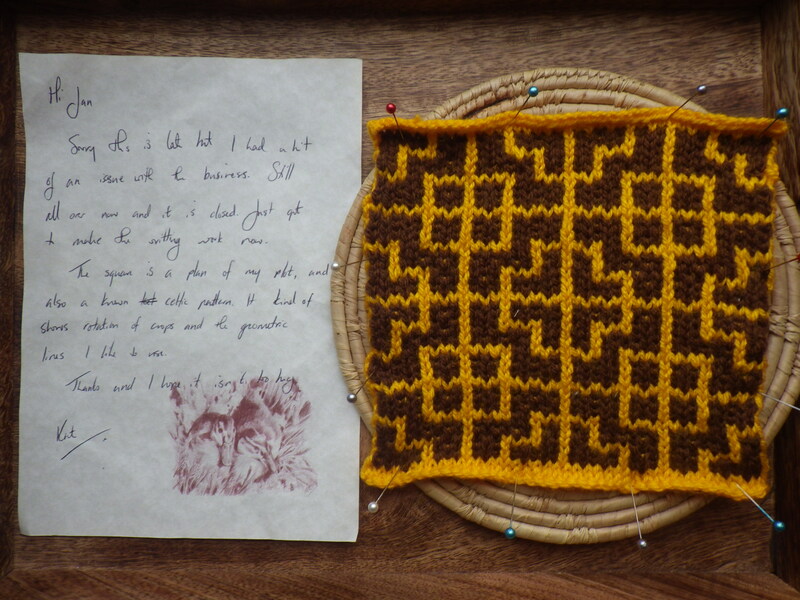 Two squares from Katy the Night Owl. I ‘met’ Katy through blogging and then discovered she lives about 500m away from me! 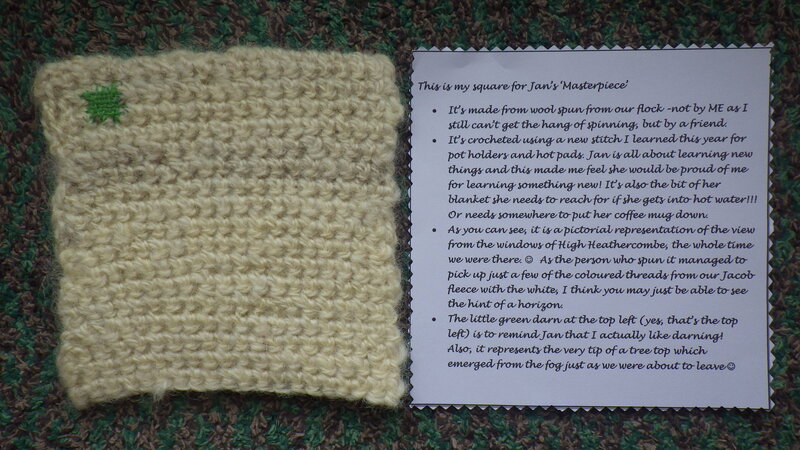 I finally got round to visiting her in person in March and she gave me the yarn for the two squares below. On my second visit, she had made me two squares herself – daffodil and willow. These represent the bunch of flowers I took her the first time I went round (picked by me). 31 March 2014. 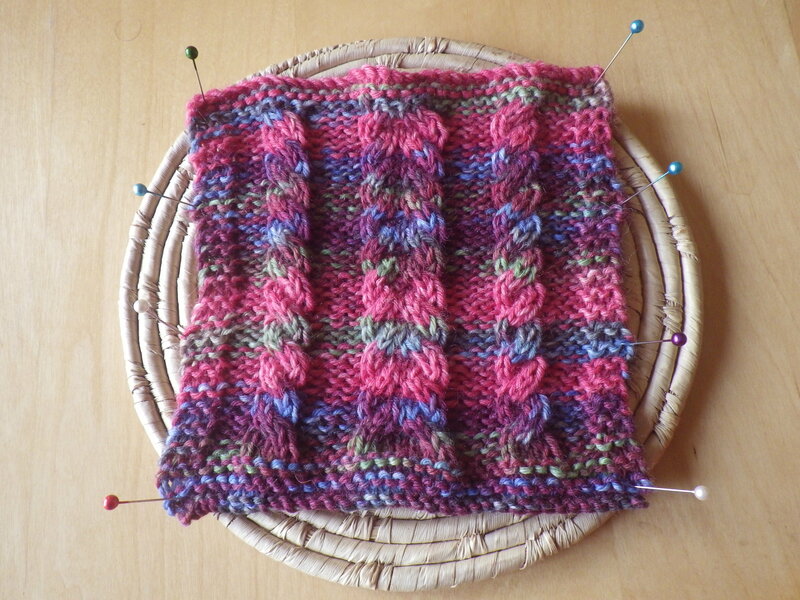 The other yarn that Katy the Night Owl gave me was a self-striping one. 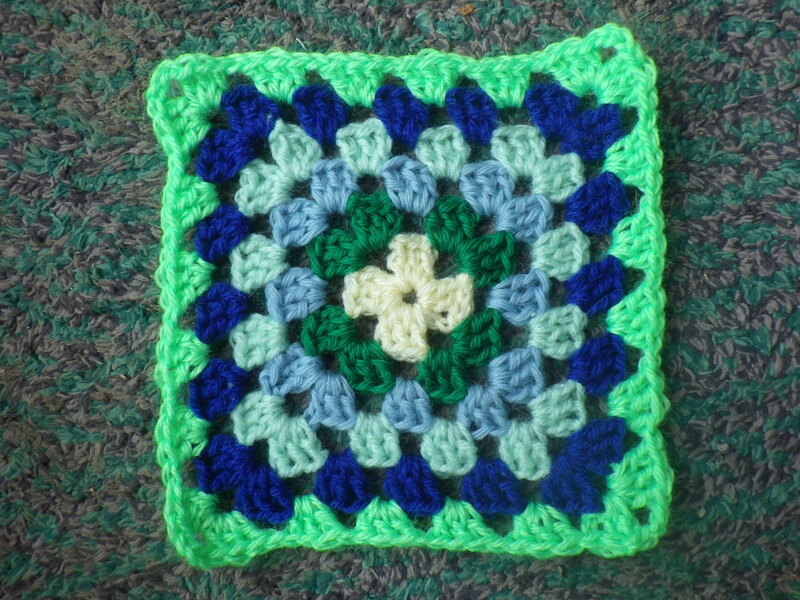 To begin with, I thought I would make a traditional granny square with it, bit I wasn’t happy with the result, so I frogged it and made a square worked in rows (I haven’t made many of these for the Masterpiece, in fact there may only be one other – the Waste of Space square). This time, however I decided to try out a stitch I have never done before and I used a shell stitch (remember I only started to crochet very tentatively about 18 months ago). 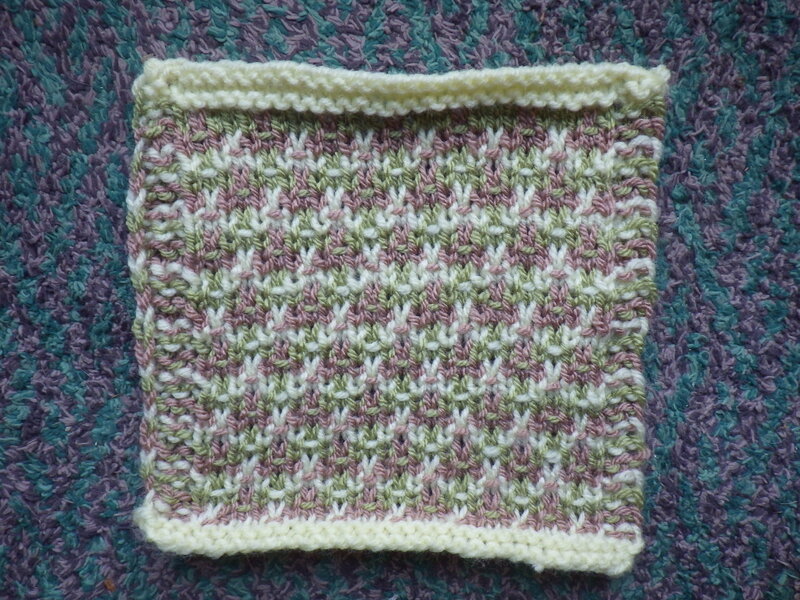 It’s not the same shell stitch as the one that Jennie use for her square, but I rather like the effect. 28 March 2014. I returned from a visit to Katy the Night Owl with a bag of yarn that she can’t use. She lives two minutes walk away, but we met through our blogs – how amazing is that? Anyway, I wanted to mark our meeting with a square for the masterpiece… this one seemed particularly appropriate. 24 March 2014. 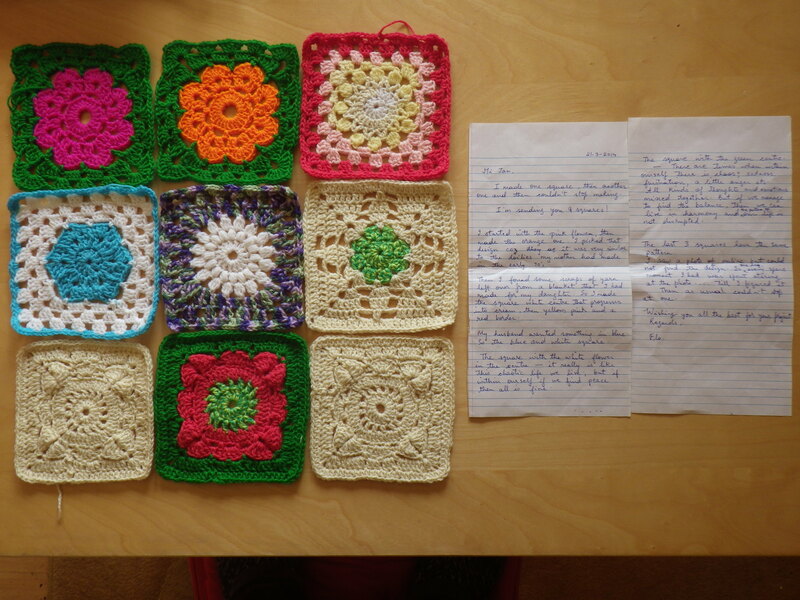 Nine squares from Flo in India… they are so beautiful. In her text, Flo describes what each square is about and what inspired her. I have arranged them in the order that she describes them, working from left to right along each row. The picture doesn’t quite do justice to the vibrant colours. Currently, the masterpiece is nine rows by six columns, so Flo’s squares are going to form a whole column in their own right. Oh, and she’s written a lovely blog post about them too, check it out here. 22 March 2014. 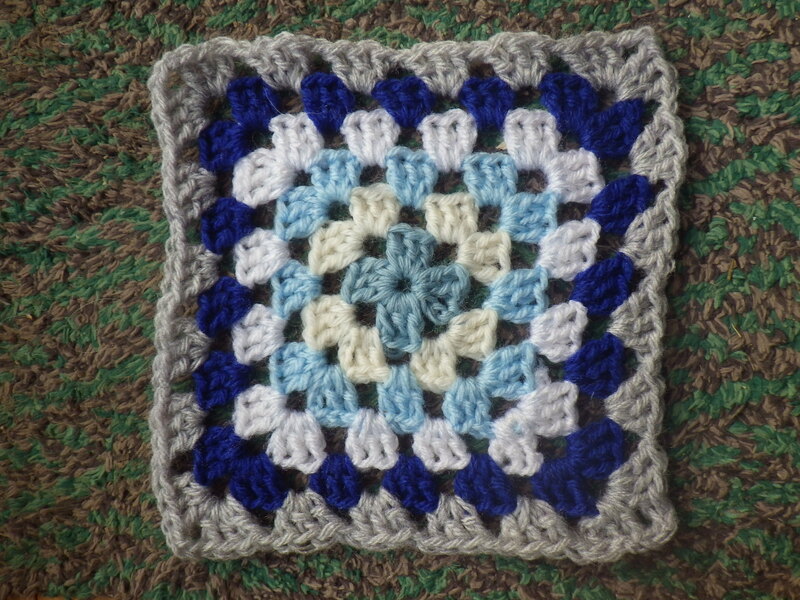 Inspired by Dani’s square below, and as a representation of the new skills that I have gained as a result of this project, this is my own attempt at Bavarian crochet. It’s made with oddments and the centre is a bit loose, but overall I’m very pleased with the result, and delighted to have learned a new crochet technique to add to my repertoire. 20 March 2014. 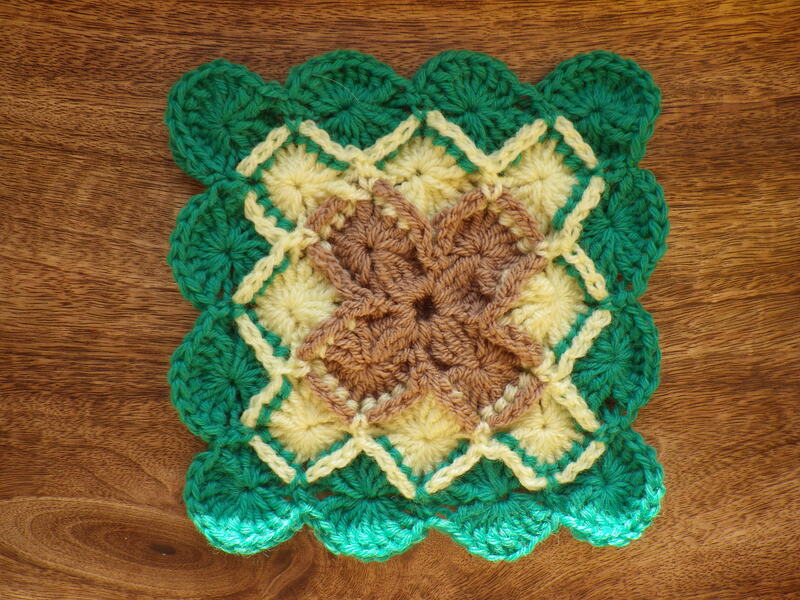 Wow – this amazing Bavarian crochet square is from Dani in Australia. It’s another one representing aspects of Australia: the red centre, gum-tree green and the sand of the coast. 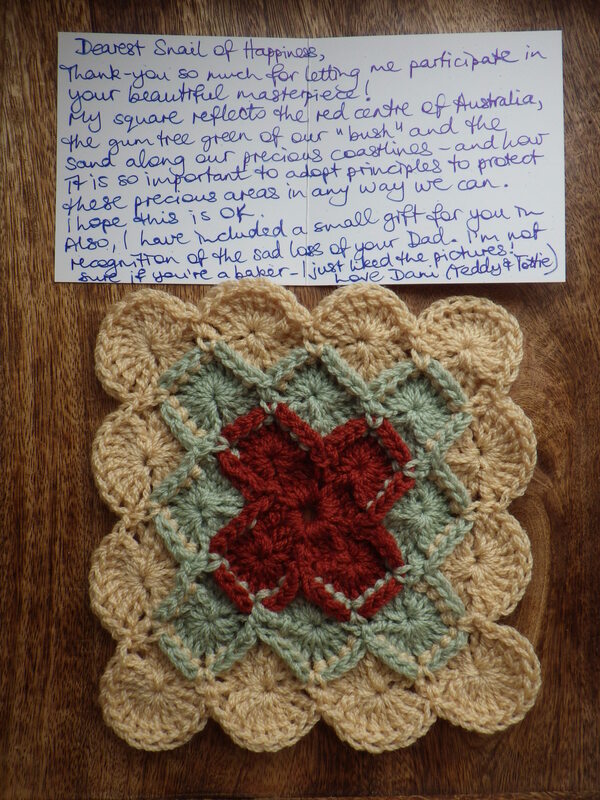 And, not only did she send me a square, she has also posted a tutorial on how to make them (see the result of my attempt above) and included a book on vintage afternoon tea in the parcel (she must be psychic – I love afternoon tea). The generosity of all my friends who are contributing to this project continues to overwhelm me! Many thanks, Dani, for the square and the inspiration. 15 March 2014. 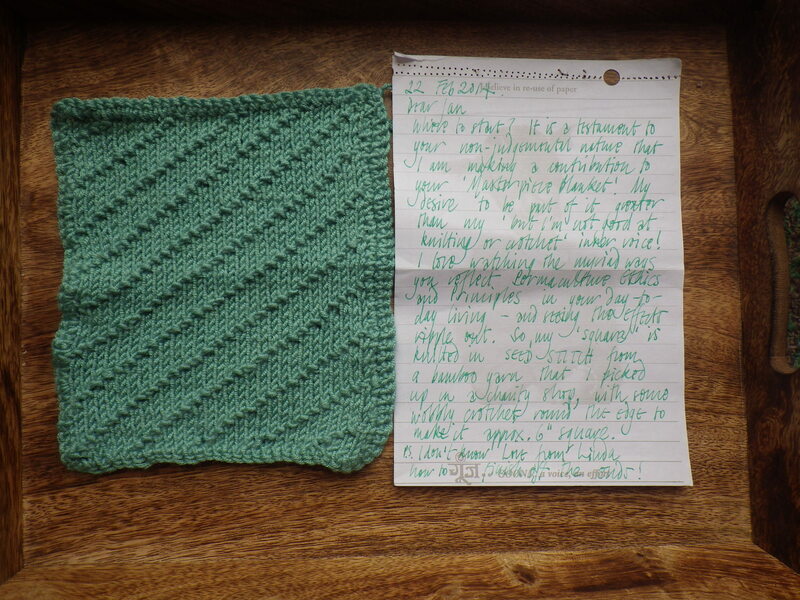 This square is from my sister… the text says it all really. 10 March 2014. During learning guild meetings we had a discussion about what ‘tools’ work for each of us when doing permaculture designs. Jane’s favourite is the three column table, which she has managed to incorporate into her (organic wool) square in a really beautiful way – superimposing plants and some magic sparkles… I love it! 4 March 2014. 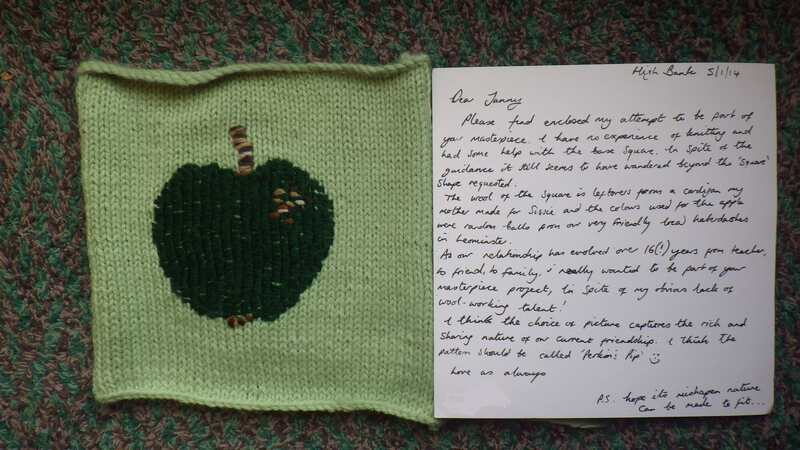 I’m touched by this contribution from my friend Linda; in her note she says “It is a testament to your non-judgmental nature that I am making a contribution to your ‘Masterpiece blanket’. 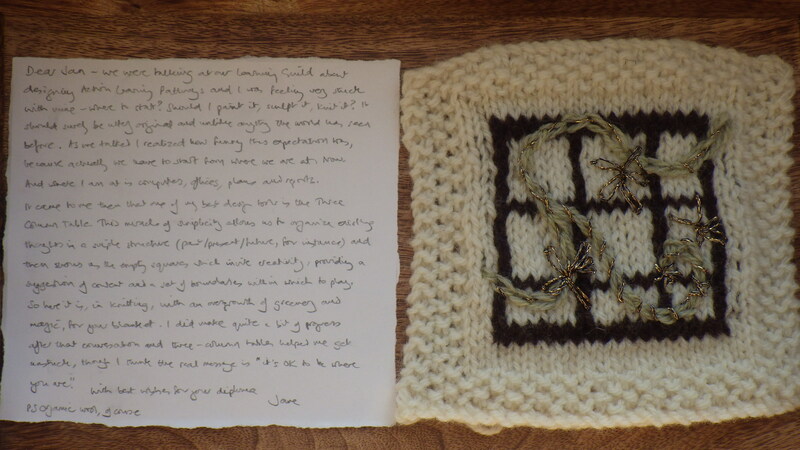 My desire to be part of it is greater than my ‘but I’m not good at knitting or crochet’ inner voice!” Her square is made from bamboo yarn bought from a charity shop and includes both knitting and crochet. 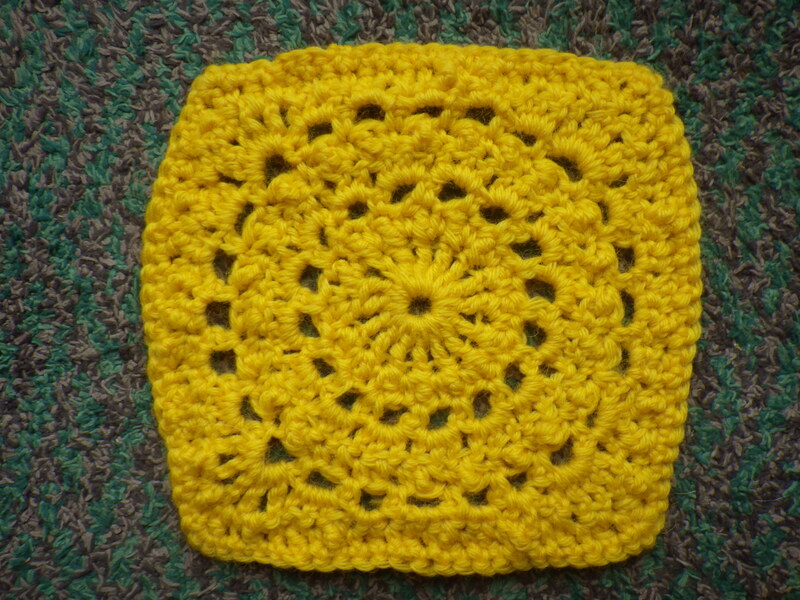 Linda attended the same beginners crochet course that I did last summer, taught by Kate, whose square is directly below. 25 February 2014. This one is from Kate Murray, who taught me to crochet… well, actually, she taught me how to follow patterns and gave me the confidence to try out all sorts of new techniques. When I attended her beginners crochet class last summer I could make a chain, a double and a treble… and combine these into bath puffs. After just one day with her (and her mum) I could do so much more. But, I digress. Kate is a very talented artist and writer and gardener… check out her blog. She chose a a Celtic theme with a design to represent her garden. 25 February 2014. My second from the US… New Mexico this time! 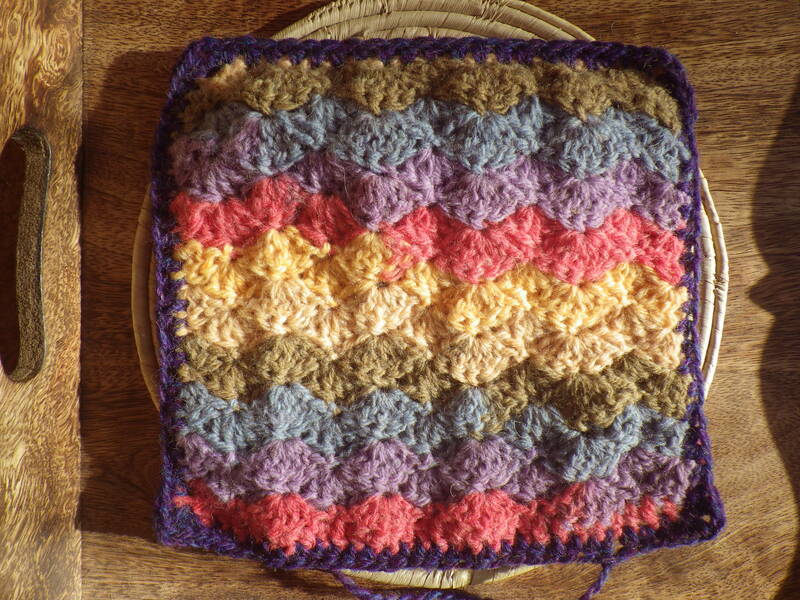 There two squares from Willow, who I have inspired to make a piece-work blanket of her own, using squares of this particular design. She sent me two of them… I photographed this one on a piece of white paper, to show the lovely pattern that you can’t appreciate if it’s on a dark background. 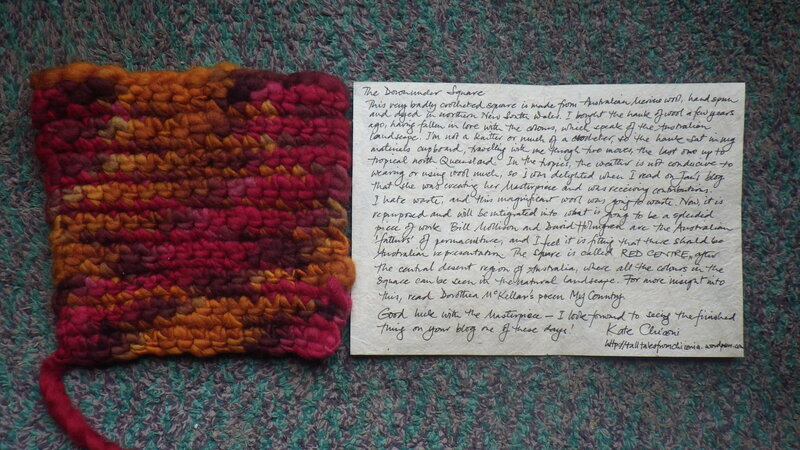 I love the colour, but I don’t think the photograph captures it very well (despite my best attempt in natural light). In her note, Andelieya mentions connectivity and they way that this project is drawing people together to make ‘one greater ONE’… it does seem like the whole is going to be much greater than the sum of the parts! Oh, and I’ve just noticed how the colours of these squares match those in Anne’s square directly below. 17 February 2014. 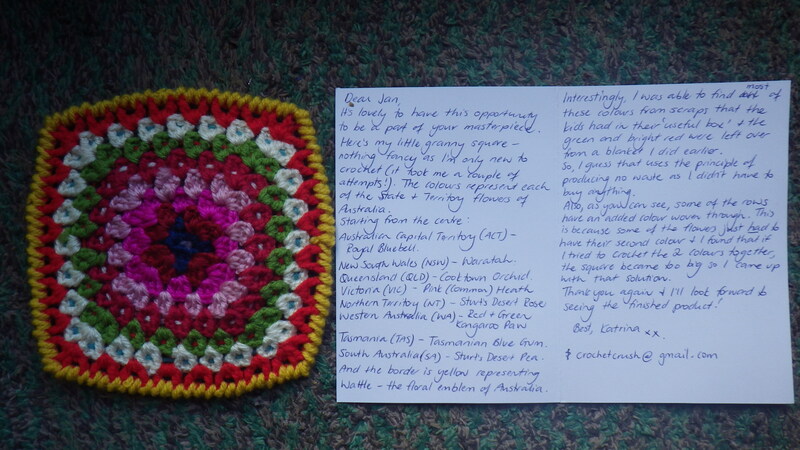 Yet another square from Australia today – you are a generous lot over the other side of the world. This one is from Anne Lawson (http://annelawson.wordpress.com/), a very talented artist, who draws, amongst other things, the most amazing feathers. 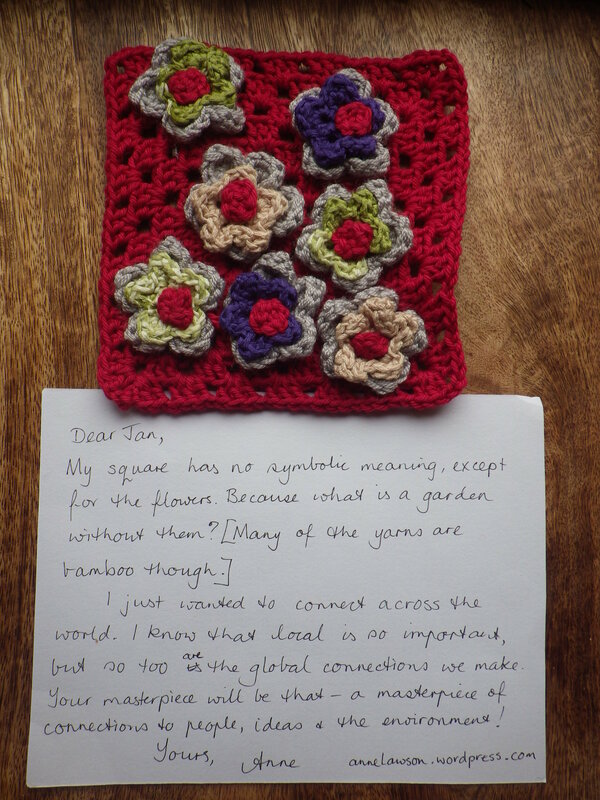 For my square, she chose a theme of flowers because, as she says ‘what is a garden without them?’ Anne highlights connections in her note ‘I know that local is so important, but so too are the global connections we make’… which is really what all this blogging is about, isn’t it? I do agree with this sentiment… if we don’t connect with people around the world, how can we value them? 14 February 2014. Today is Valentines day and I received this beautiful square from my friend ‘Young at Fifty’ (Things I want to create before wrinkles overwhelm me). 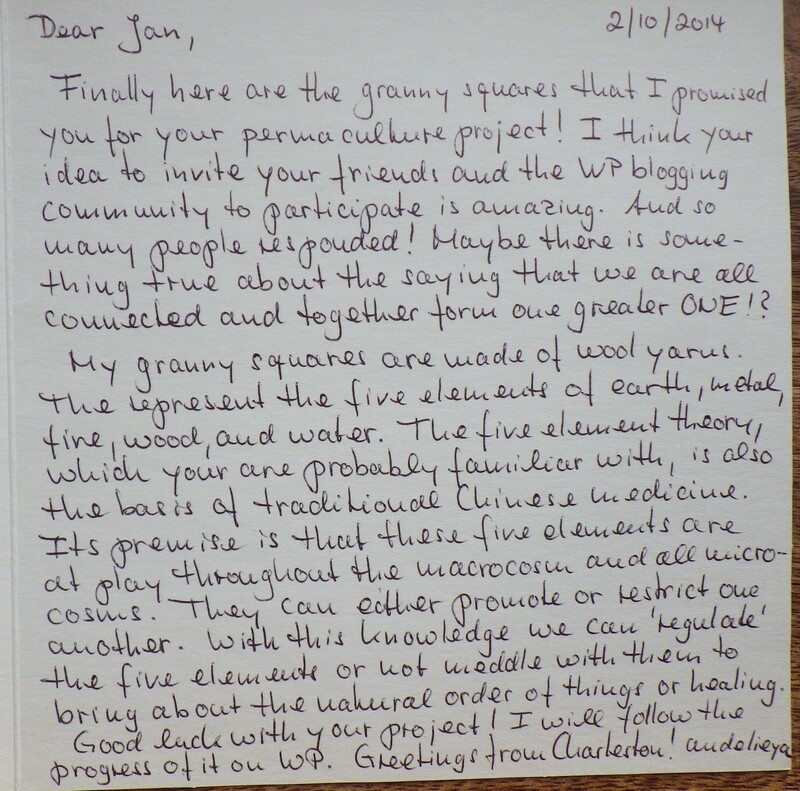 In her letter she says that her square is “a small contribution to a sustained friendship” – how lovely is that? 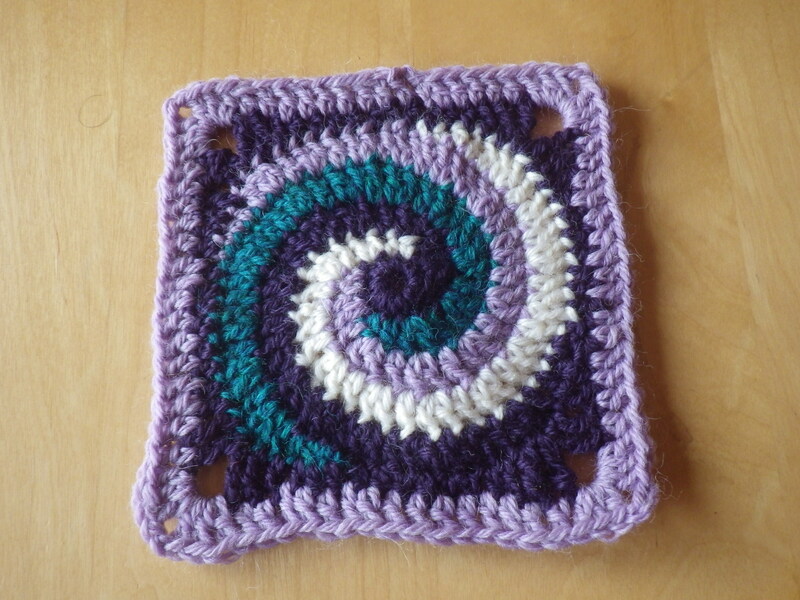 The spiral is a bit like the one that I used for my ‘snail of happiness’ square, but with three colours rather than four, and there’s the added feature of the snail itself too. This isn’t the best picture I’ve ever taken because the light is terrible today; in reality the black has silver sparkles in it and the snail body is pink, however, the yellow read and green in the picture are good representations, so that’s something. 6 February 2014. A square from Jill (Nice piece of work) from South Africa, representing the principle of fair shares. Not only is the cotton grown and produced in southern Africa, it is dyed in the Western Cape and the business contributes to the local economy. 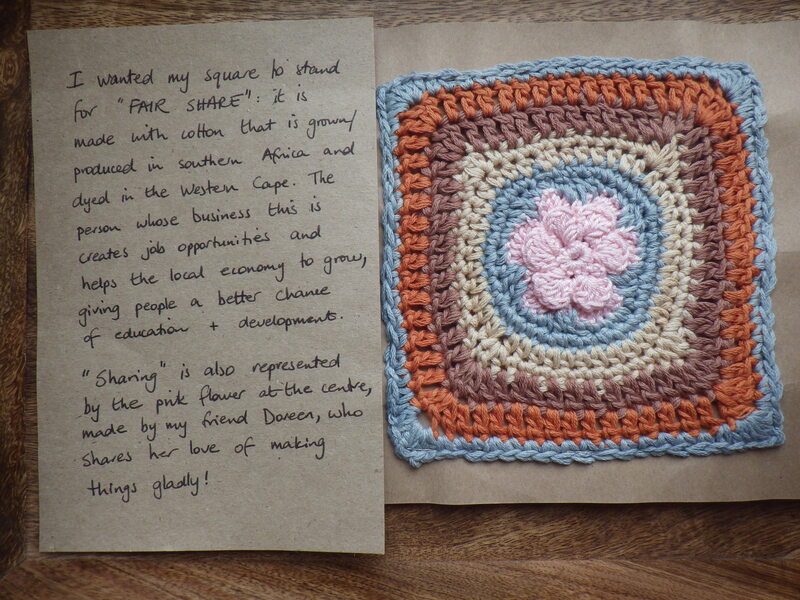 In addition, the sharing is represented by the fact that the pink flower in the middle was made by a friend of Jill. 31 January 2014. Another one of my own creation in the ‘flowers’ series… I really like how this one turned out. 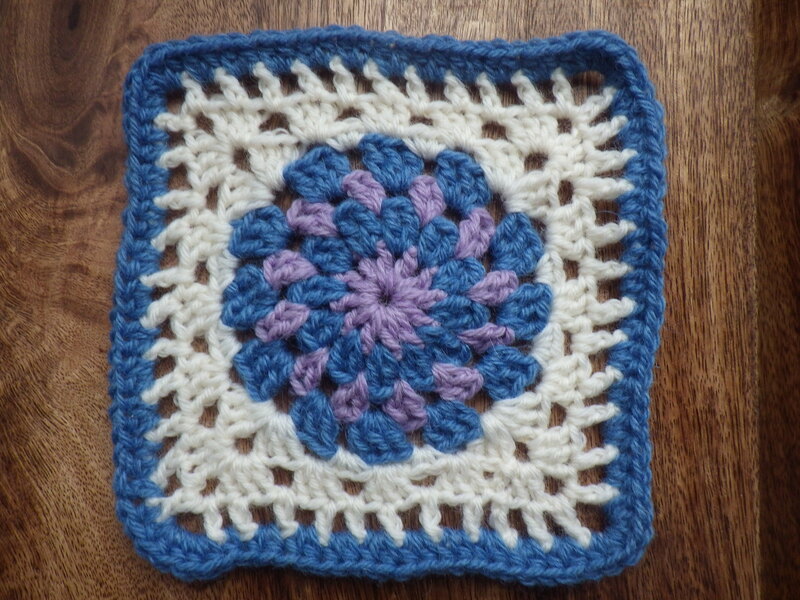 I’m rather unsettled at the moment and these simple squares are lovely to make to calm myself down… if life continues to be as stressful as it has been recently, this is going to be an enormous blanket! 30 January 2014. A square from Ann – one of the social reporters for Transition. Ann attended one of my Introduction to Permaculture courses and found the idea of zoning particularly memorable so her square represents zones and the fact that they do not take the form of concentric circles. 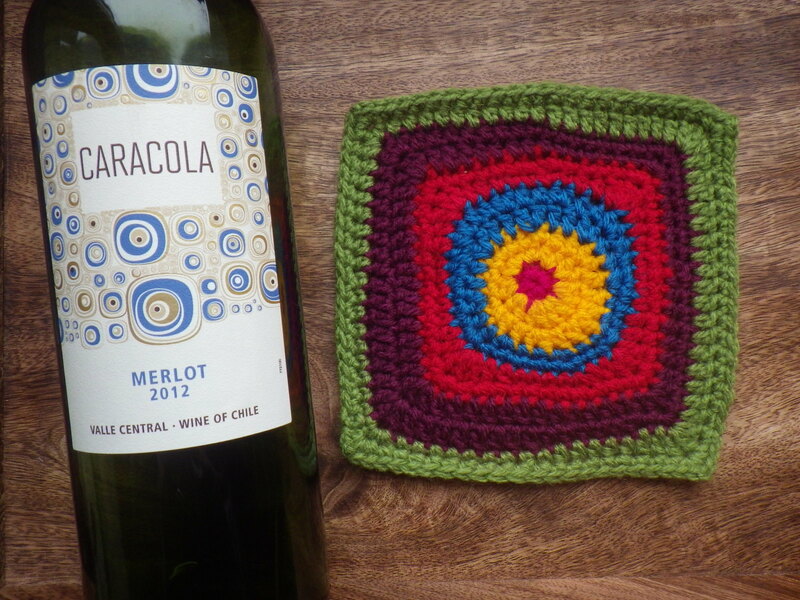 She was inspired as well be the label on a bottle of Caracola wine… and interestingly, in Spanish ‘caracol’ means snail. 30 January 2014. 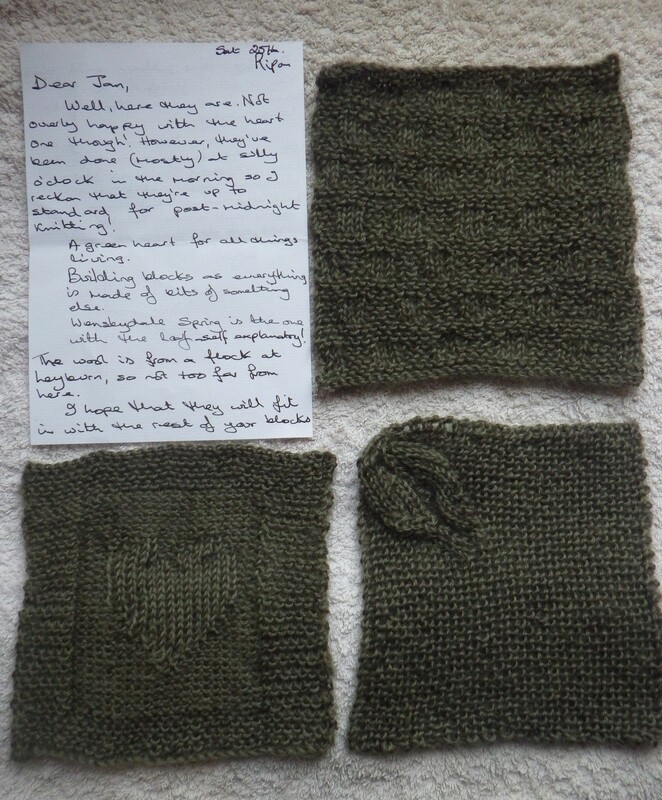 Not one but three squares from Nia… she lives in Yorkshire and used Wensleydale wool to knit them, but she originally comes from Llanberis, so they are a Yorkshire-Welsh fusion… very apt since I grew up in Yorkshire but have spent most of my adult life in Wales. 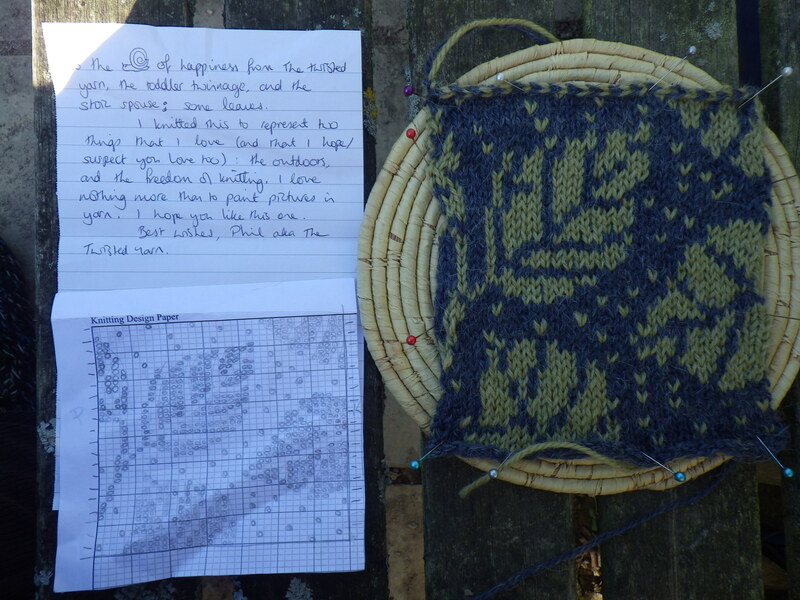 I love the designs and I realise that I haven’t made any squares myself where the pattern is just the result of the stitches (apart from the cabled ‘design from patterns to details’ square). The wool is beautifully soft and Nia sent me the rest of the ball, so this wool is likely to be making an appearance in other squares too! 28 January 2014. Many of the squares that I have crocheted have relied on published patterns (referenced with the pictures below) because until recently I haven’t felt I had the skills to make up my own designs (the same is not the case for the knitted squares – I’ve been knitting for about 35 years and crocheting for about 18 months!). However, following other people’s patterns has increased my confidence and so I have started making up my own designs. 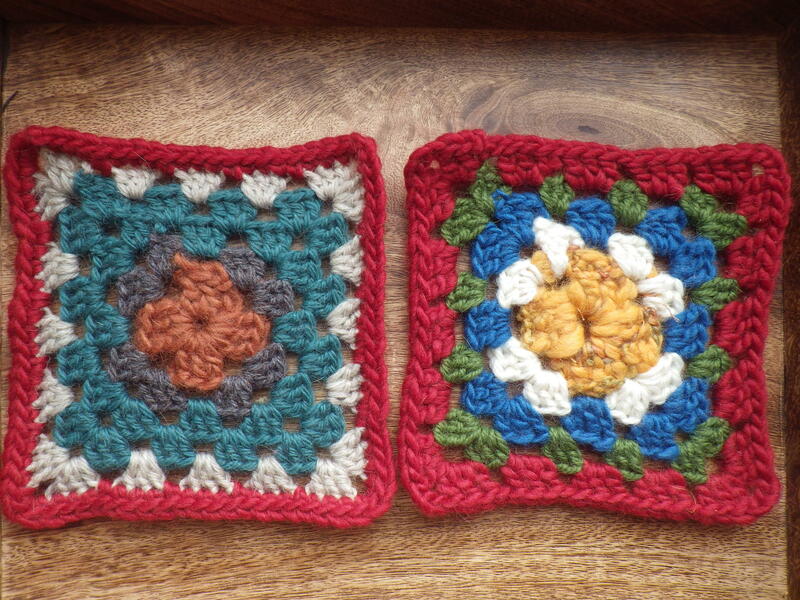 I decided to try out my skills by making some flower squares because these also reflect my interest in the natural world and botany in particular. Since the finished blanket represents my diploma pathway, I like the idea that some learning has gone into its creation… expect more of these experimental squares to appear! 27 January 2014. 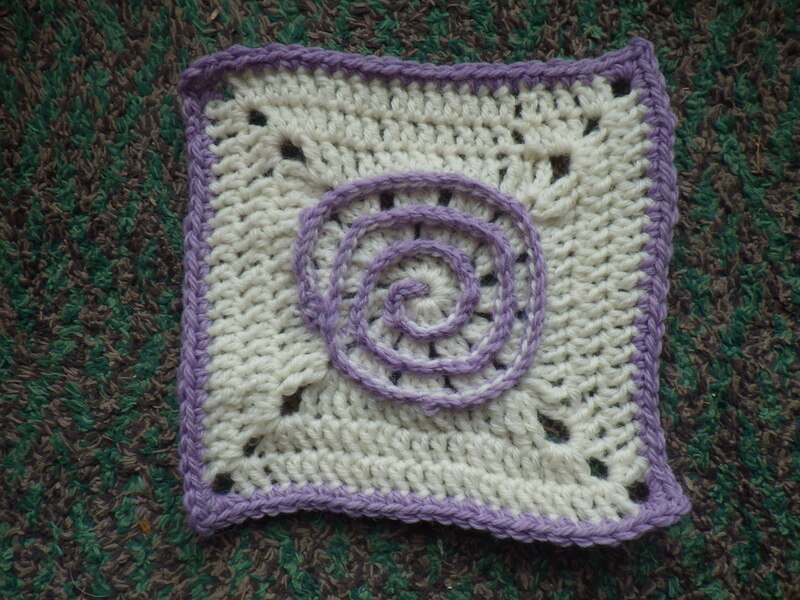 Another meditation square. Yarn from Freecycle. Very old-fashioned design, but I’m quite pleased with the look of it. 26 January 2014. Over the past few days I have been feeling quite unsettled because Mr Snail-of-happiness has been away helping my sister to move house. Nothing went wrong, I was just fretful. 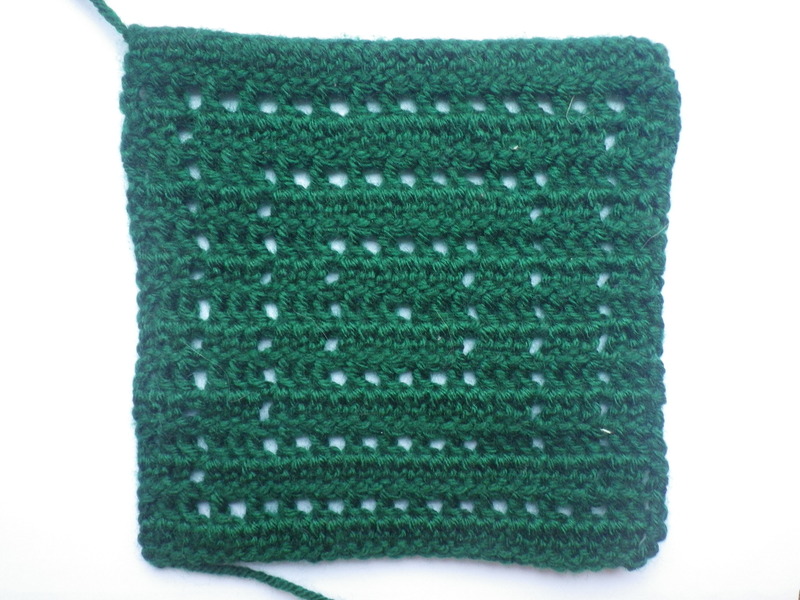 Anyway, to help me relax, I have been making a series of ‘meditation squares’: simple patterns that I can crochet whilst allowing my mind to explore other things, or listen to a talking book. All of them are made from oddments of yarn. It’s rather nice choosing the colour combinations too. 22 January 2014. Two Australian squares in one day: this one representing fauna, at least the conflict between native animals and introduced ones (the cats in the design). 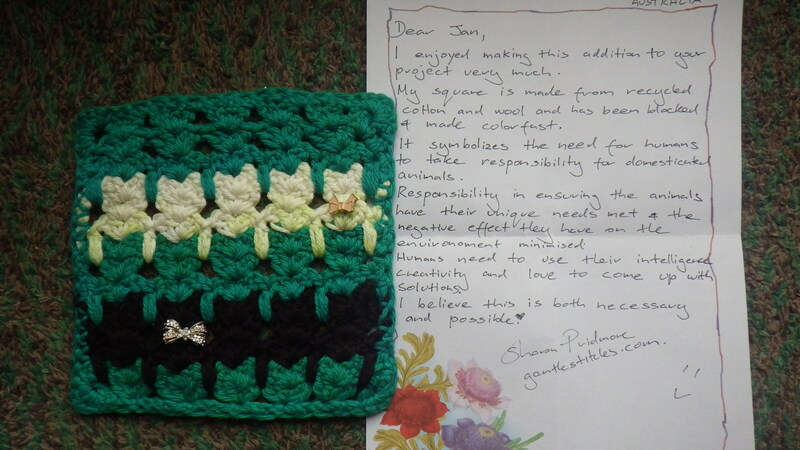 This is from Sharon of Gentle Stitches. She used recycled cotton and wool plus two little embellishments that can be detached if required (but I’ll keep them on except for washing). 22 January 2014. 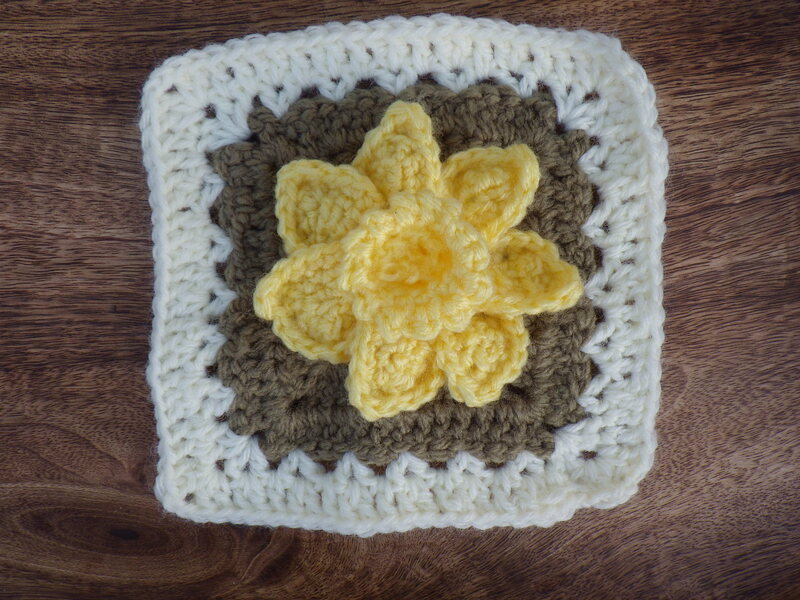 A square representing the State flowers of Australia from Katrina of Crochet Crush. The text lists all the flowers… in the scrapbook, I will try to include pictures of all of them too. This design is really special to me… I love the idea of representing the flora of the country it came from. And all made out of scrap yarn too! 21 January 2014. 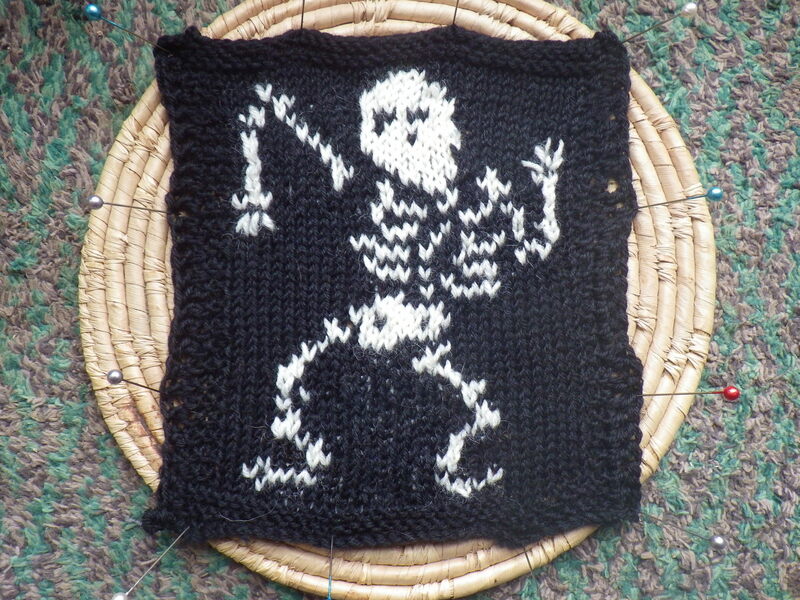 After one failed attempt that ended up being too large, here is my dancing skeleton. I had to knit it in 4-ply to get it the right size and then it was a bit too narrow, so it has a crochet edging. It’s not quite perfect, but I will modify the design for future use and create a chart that I can sell too (an additional output). 19 January 2014. Spread a little happiness… or a little sunshine. 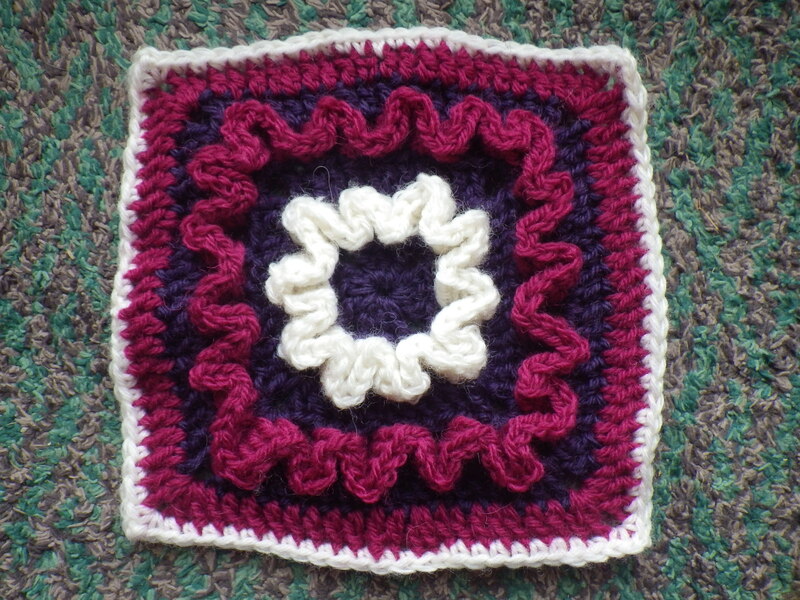 This square represents the design I’m working on to improve my blog. 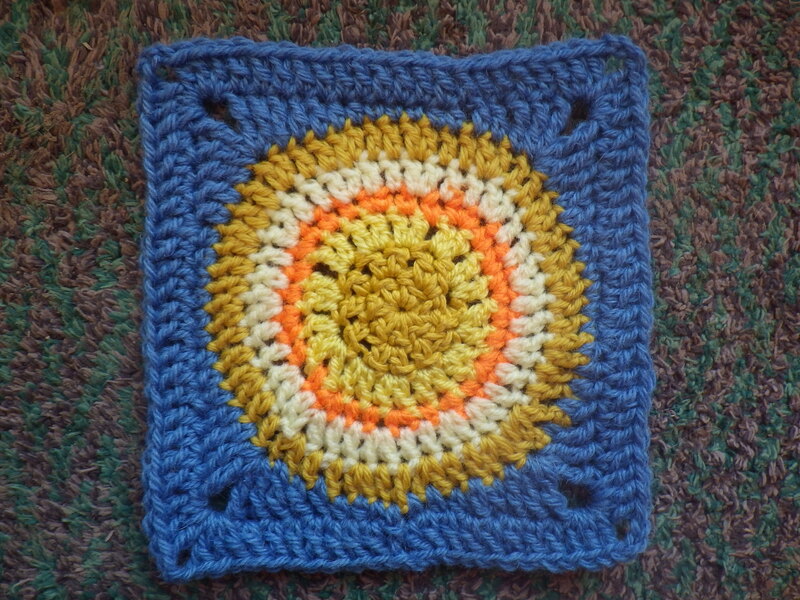 I used oddments of yellow yarn to make the ‘sun’ in the middle and then some blue from Blacker Yarns for the surrounding blue sky. 18 January 2014. 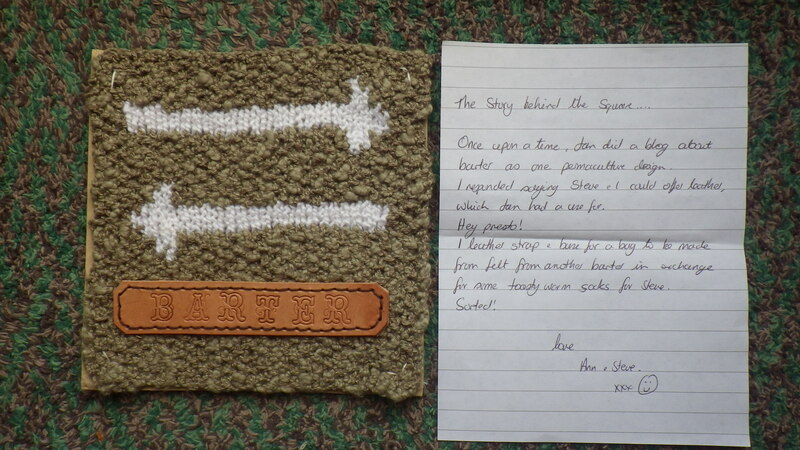 A square all the way from Australia… how fabulous is this? And look at those colours. This one is from Kate Chiconi… check out her lovely blog about quilting, gardening and life in tropical Australia here. There’s lots of explanation about the square in the text, so I hope you can read it (click on the picture to enlarge it)! Kate mentions the poem ‘My Country’ by Dorothea Mackellar and you can read that here. 17 January 2014. Another one made from Blacker Yarns wool… this one represents my design for two chapters of the new permaculture research handbook, being compiled by Pippa (of Those Plant People). I have written chapters on collecting and analysing data, so this square represents a split-plot experimental design… beloved by those doing biological research! However, there’s something more personal too… Pippa had a baby whilst working on the handbook and his name is Moss, so the border of this square is in moss-stitch to acknowledge his contribution too! 11 January 2014. 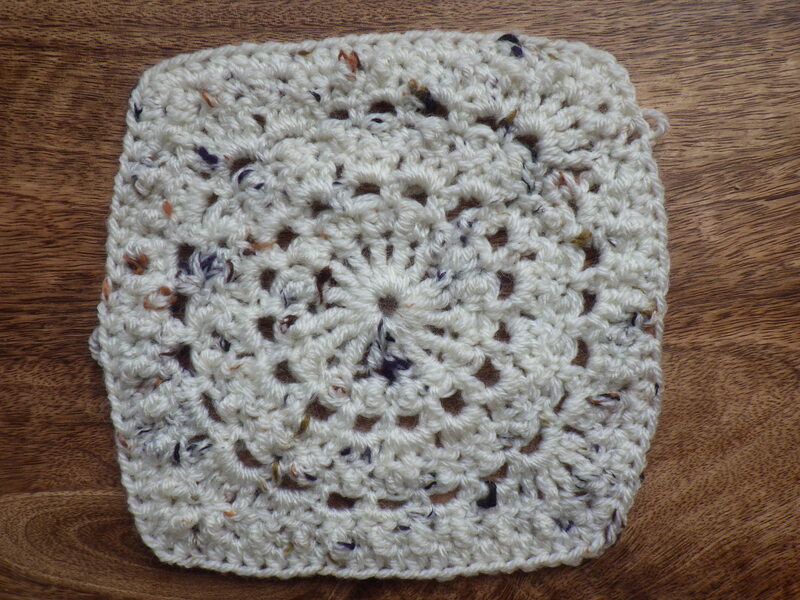 I bought the wool used to make this square specifically for a bit of bartering: four crochet squares in exchange for some Australian seeds! The yarn (a mix of Blue-faced Leicester and Lleyn) is spun by Blacker Yarns in Cornwall. 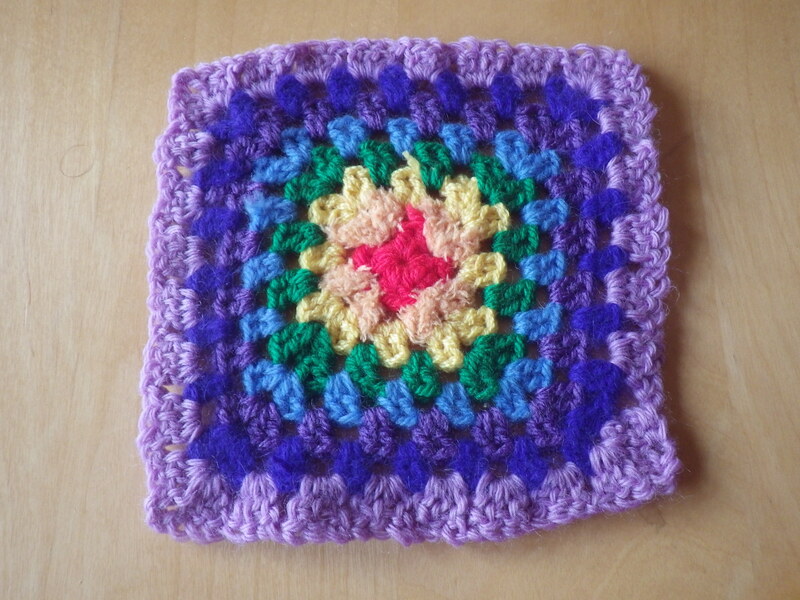 I chose to make a traditional granny square to represent a skill that comes easily to me, but may be desired by others – perfect for bartering. 10 January 2014. It is very odd that on the day I started making this square, I received the one below from Perkin… we must be on the same wavelength! 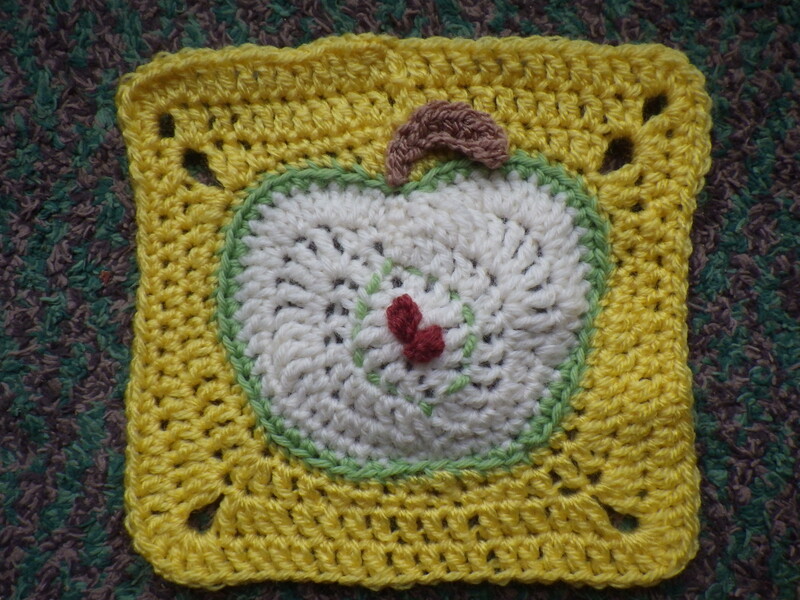 The centre of mine is inspired by the cut apple pattern in the book 75 Birds and Butterflies to Knit & Crochet by Lesley Stanfield, and then I had to do some fancy hooking to create a square around it. 9 January 2014. All those apples from High Bank clearly inspired my friend Perkin! This is a really unexpected contribution, because Perkin does not knit. I love the embroidered apple, with all the colour detail. 7 January 2014. Another lovely square from a permaculture friend. This one is all about bartering… as explained by what she’s written. 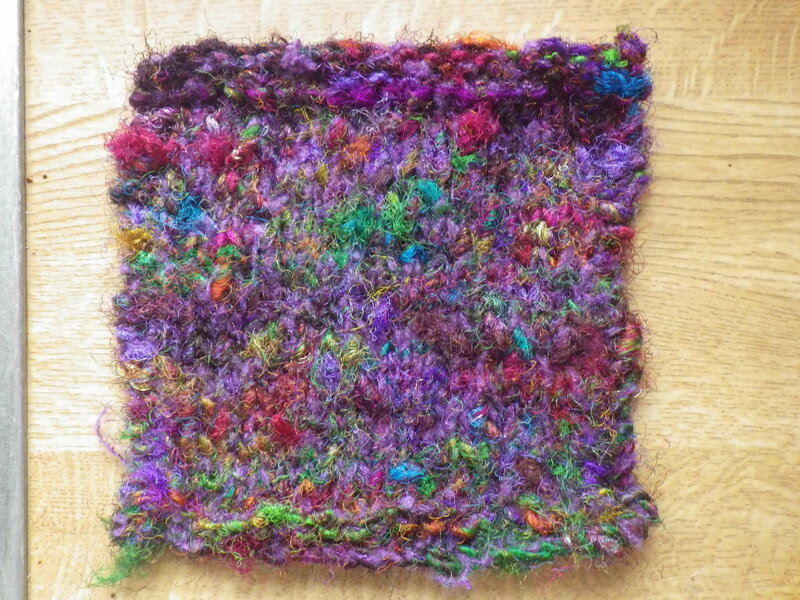 This is a special square because it has the addition of a leather embellishment, made by Ann’s partner, Steve. 6 January 2014. 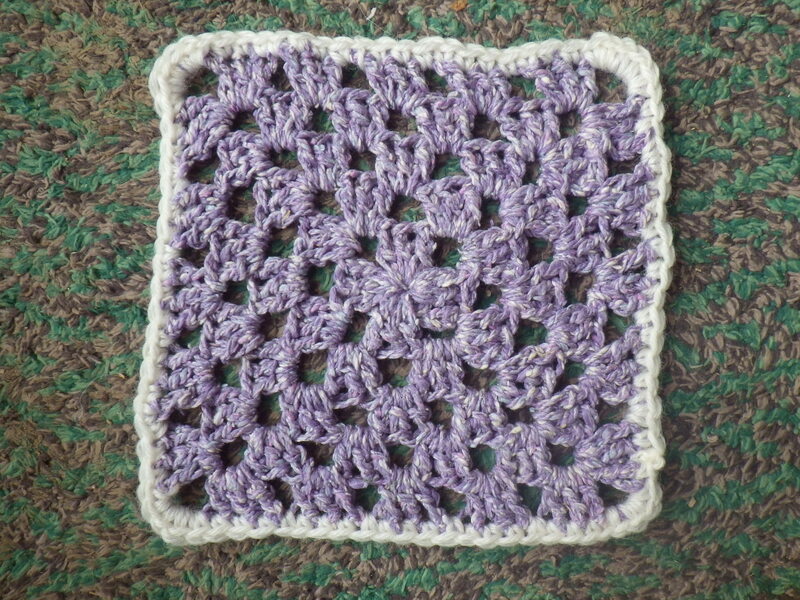 Most of my squares so far are crochet because knitting takes longer, so this knitted one represents a slow solution. 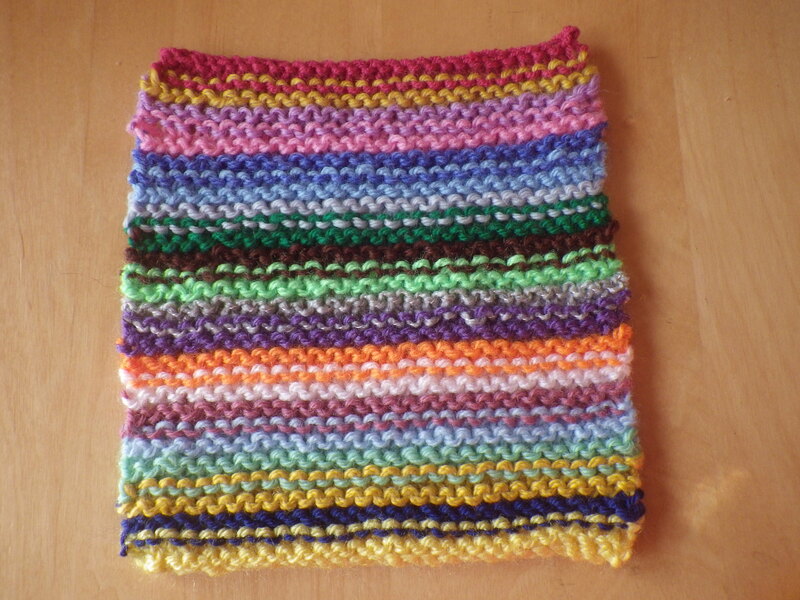 Interestingly, even though the pattern looks quite complicated, each row only involves using one colour of yarn, so it’s relatively easy to make. This design is called Tri-Tweed and is by Terry Liann Morris, you can find the instructions here. 6 January 2014. A square from Mrs Robinson – we’ve been friends since we were both 18. 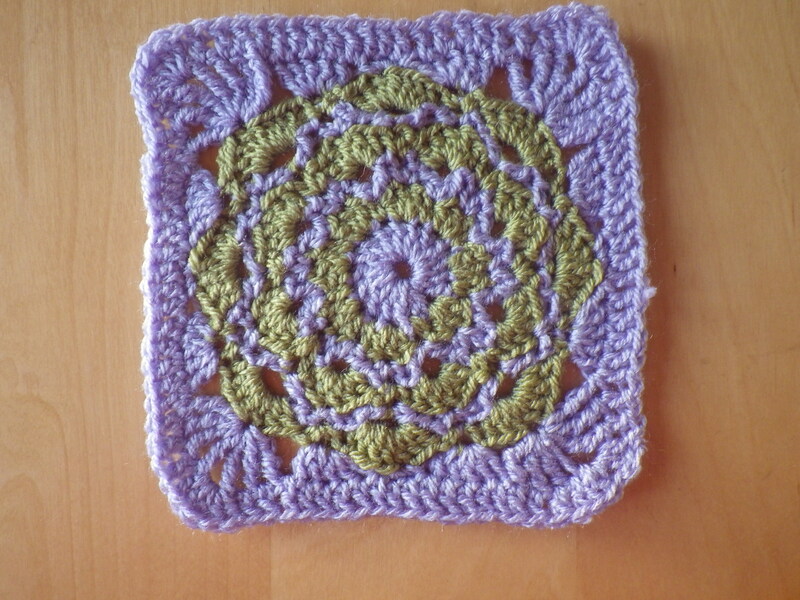 The flower design represents our shared love of botany, and comes from the book Granny Squares by Susan Pinner. She added the purple round because she knows I love the colour and the yarn is hand-spun Herdwick from Bowland (where she lives), surrounded by a green that looks like Sphagnum, surrounded by a multi-hand-dip yarn bought in Skipton, and the centre and edge are in yarn from a secondhand shop on Islay – wow what a combination! 6 January 2014. A square from Snuffkin – wool spun from her own Jacob’s sheep, with a little green darn to remind me that, although I hate darning, she loves it! We first met face-to-face at High Heathercombe, when the view out of the window looked pretty much exactly like the square! 5 January 2014. Another one that was really nice to make, but requires lots of yarn because the wiggles are worked in after the body of the square is completed. A whole blanket of these would be very warm! The design, representing the permaculture principle ‘use edges and value the marginal‘ is from Debi at Hooks and Yarns and you can find her pattern here. 5 January 2014. 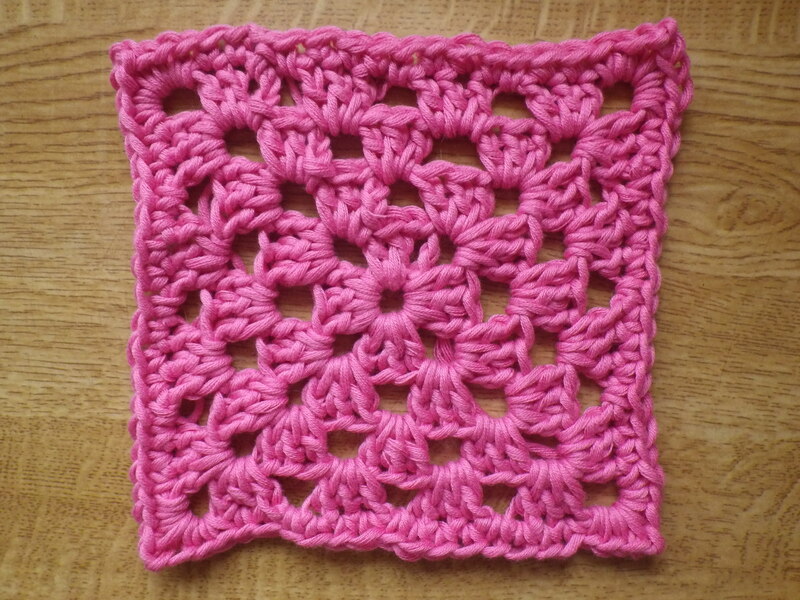 This square is not very well executed by me… I had a bit of a problem with counting! However, I’m going to include it anyway as it represents the design cycles often employed in permaculture design. 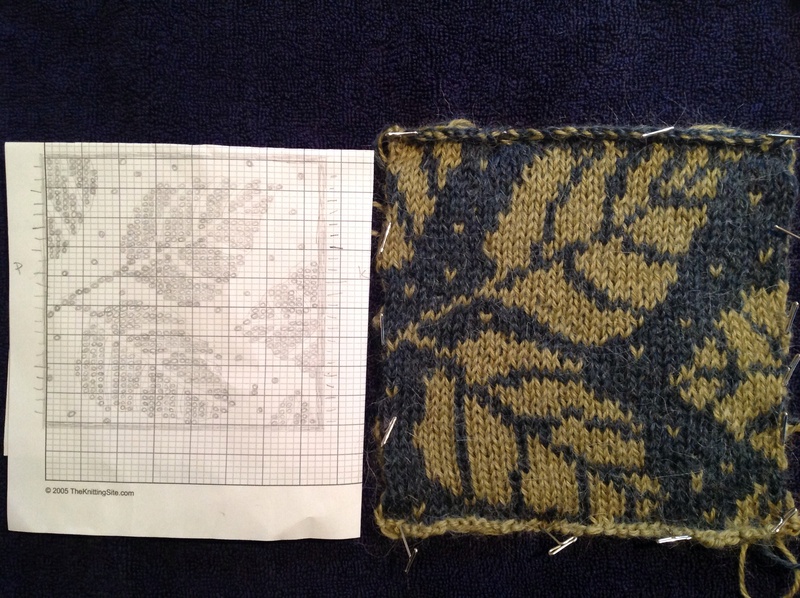 The pattern is (nearly!) SmoothFox’s Vertigo Illusion square, which you can download from here. 4 January 2014. 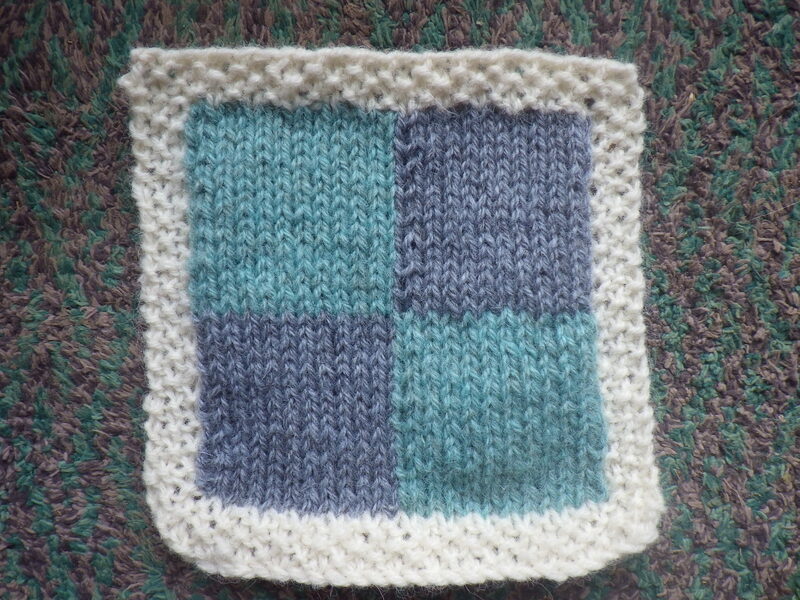 A simple knitted square. The yarn embodies all three of the permaculture ethics: people care, earth care and fair share. It is made from recycled sari silk, produced by a women’s co-operative in Nepal ‘from remnants from the silk weaving mills and from old silk saris… shredded and re-spun by hand into this beautiful multi-coloured yarn’. 3 January 2014. 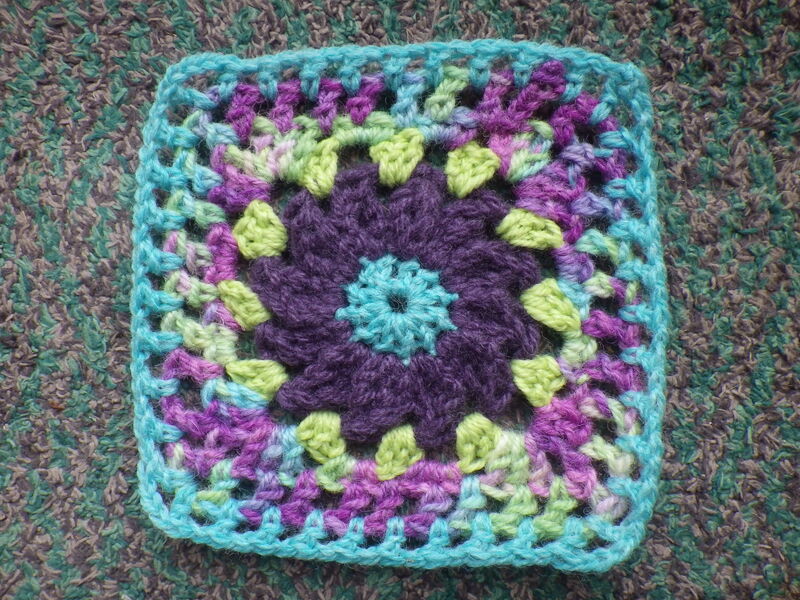 Simple granny square made from Debbie Bliss organic cotton. The yarn represents the permaculture principle ‘use and value renewable resources‘ because a plant-base fibre like this, grown using organic principles, is completely renewable and should also maintain the soil in which it is grown. 2 January 2014. A fun square representing the principle ‘observe and interact‘. What better observer than an owl? The pattern for this Owl Granny square is available here. I increased the number of rounds in the background colour to make it the right size. 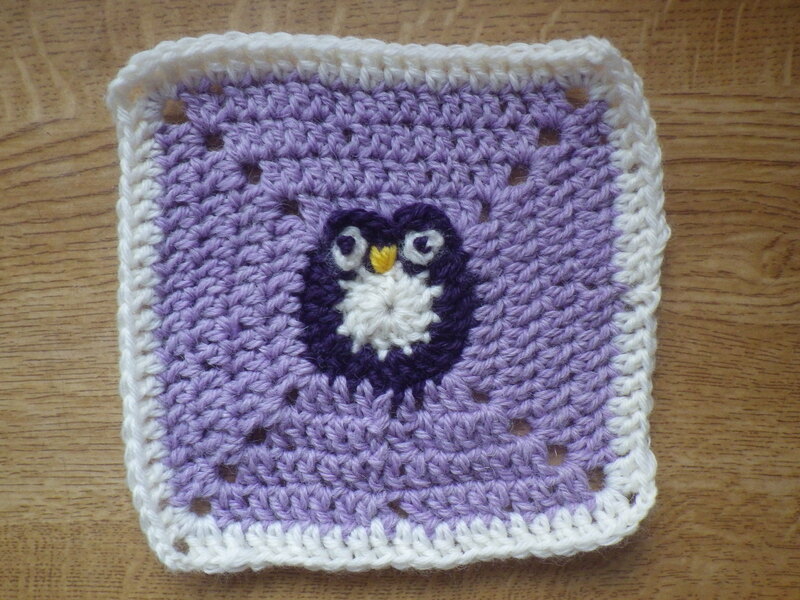 I’ve subsequently found several other owl square patterns, so I may have to think of other reasons to use those! 2 January 2014. 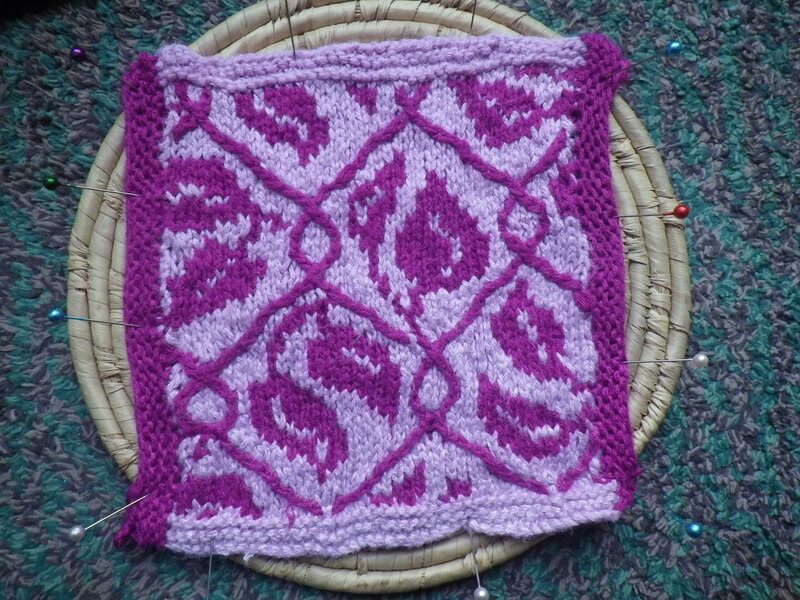 I’m not sure the picture does this square justice, but the dark purple round does extend into the cerise stitches around it; this, along with the mix of colours, represents the principle ‘integrate rather than segregate‘. 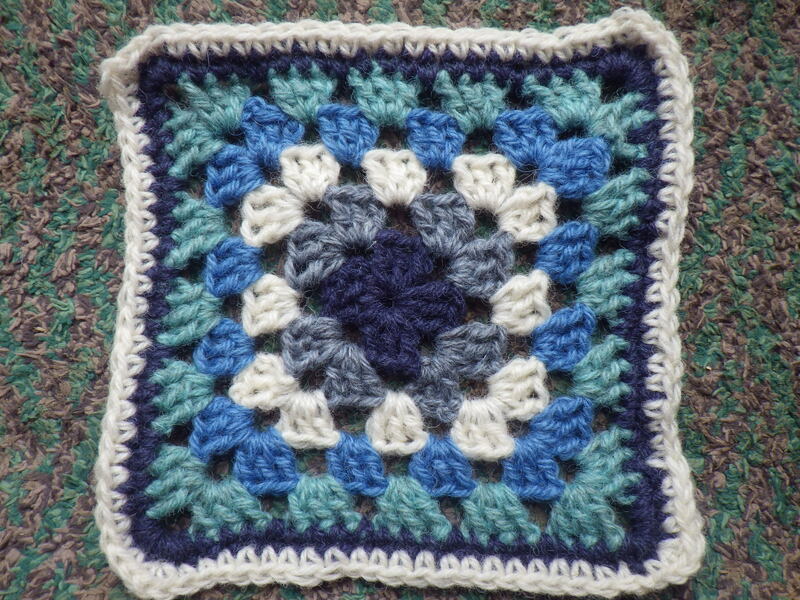 This design is called Woolly’s Snowflake Square and you can find the instructions here. 1 January 2014. I decided to work on permaculture principles today. 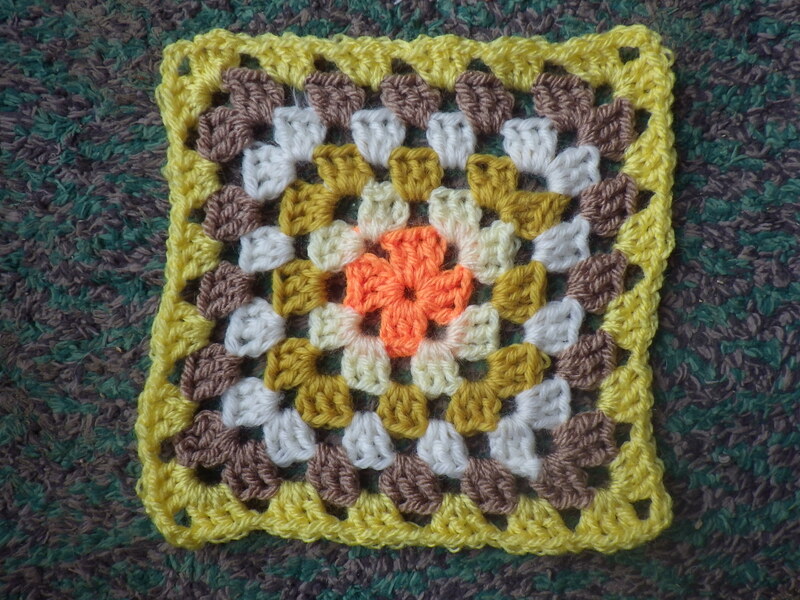 This one is a square designed by Priscilla Hewitt called Amber Waves. I chose it to represent ‘catch and store energy’ because of the link between energy and waves. I really liked making this one and the instructions are particularly clear. 1 January 2014. 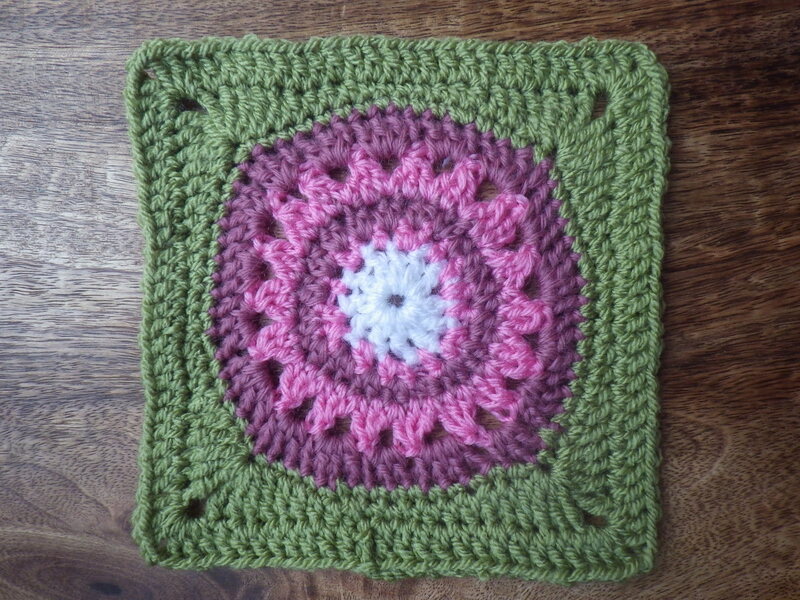 A sunny square entitled Circle of friends, again by Priscilla Hewitt. The square represents the principle ‘apply self-regulation and accept feedback‘ because the friends I have made here on the blog and elsewhere during my permaculture activities have given me all sorts of feedback – encouragement, suggestions, constructive criticism – all of which help me with my designs and implementation of my sustainability goals. I selected the colour because it’s bright and positive. 27 December 2013. We had a tiny bit of space that I wanted to be productive, so I designed a scheme to grow potatoes in old dumpy bags and mangetout up the fence. 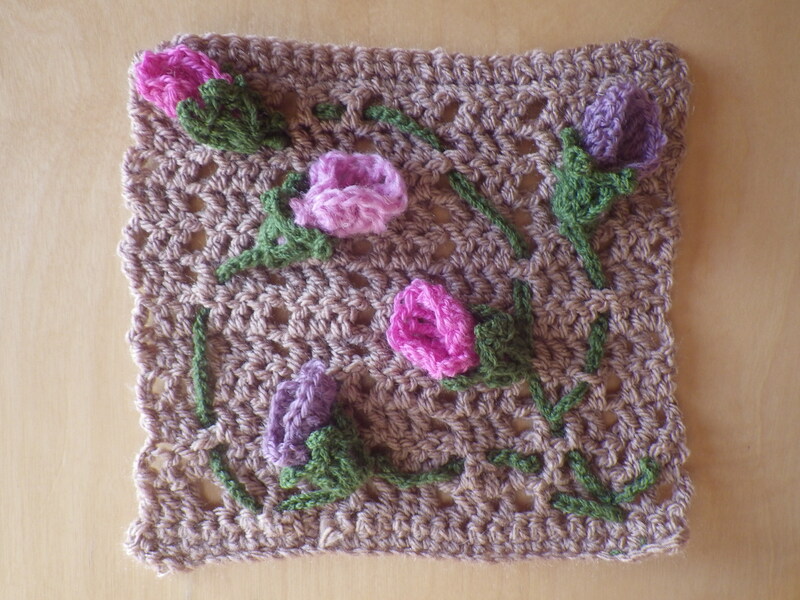 This square represents the latter – the pea flowers are from the book 75 Birds and Butterflies to Knit & Crochet by Lesley Stanfield. 27 December 2013. 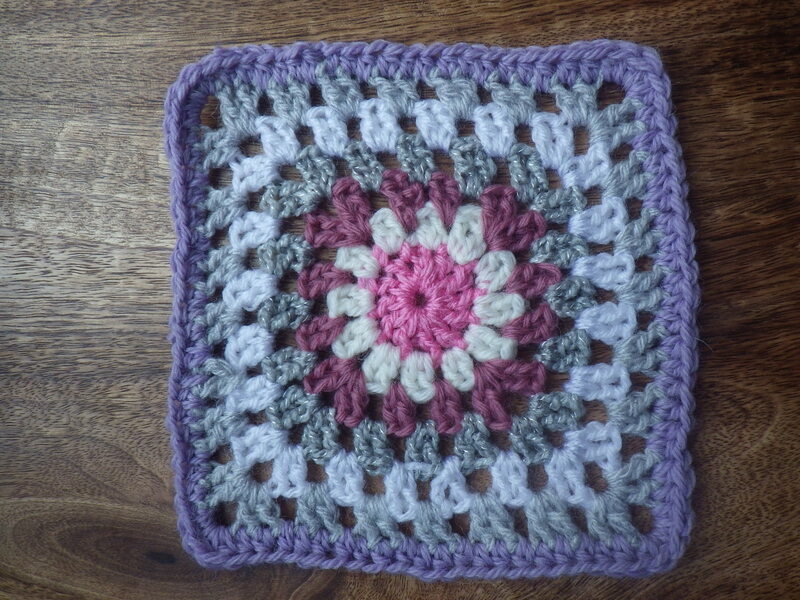 I started making a square called ‘Dreamweaver‘, but when I had completed the sixth round, I realised that if I continued as per the pattern, the finished object would be too big. So, applying the permaculture principle ‘creatively use and respond to change’ I finished the square in my own style and produced a unique end-product! 25 December 2013. The very first design I did for my diploma was for my tutor, Looby. She asked me to design a way for her to manage and interact with her diploma apprentices… with me as the guinea pig. It turned out to be a great experience, but very complicated because I was both designing and experiencing the design. Sometimes it’s hard to tell whether I’m the apprentice or the guide, so I chose a complex, intertwined pattern to represent this. 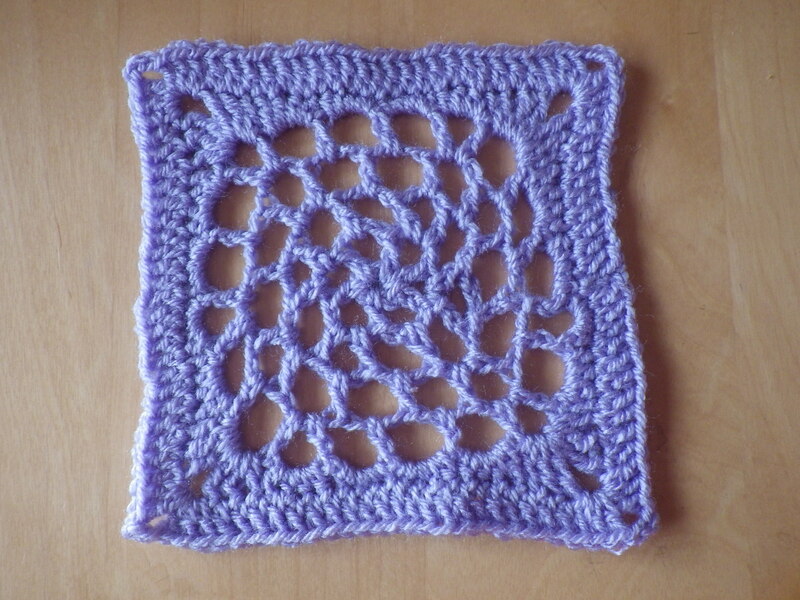 The square is knitted using a stitch pattern called Ithilien Brocade, which can be found here. 24 December 2013. 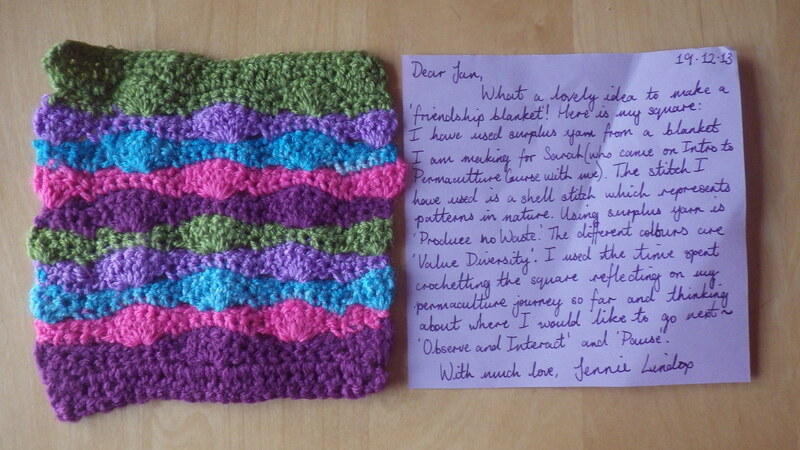 Jennie included the principles: ‘produce no waste’, ‘value diversity’ and ‘observe and interact’. 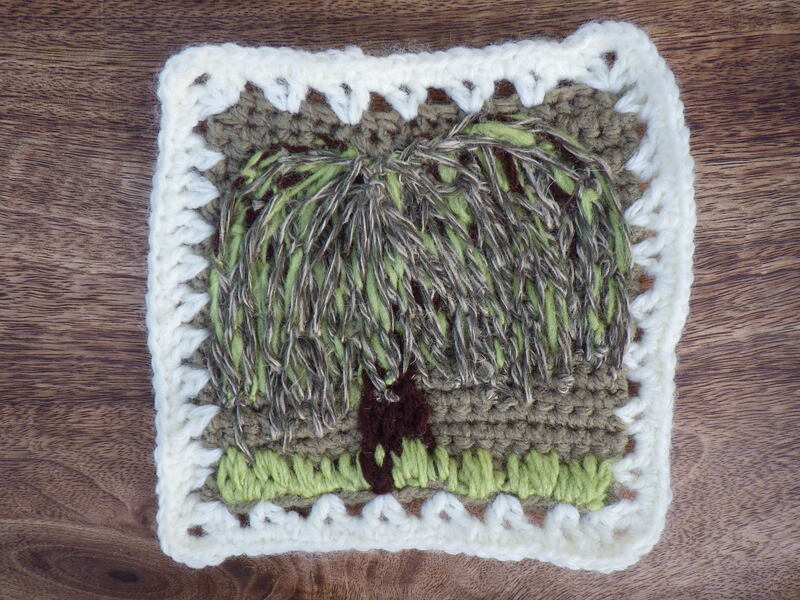 She also thought about patterns from nature in her shell stitch and used the time she took to crochet her square for reflecting on her permaculture journey. 22 December 2013. This square was inspired by a framework that I used for three of my permaculture designs, namely Looby MacNamara’s Design Web. Looby is also my tutor so I enjoyed getting her perspective on using this approach during my tutorial sessions. 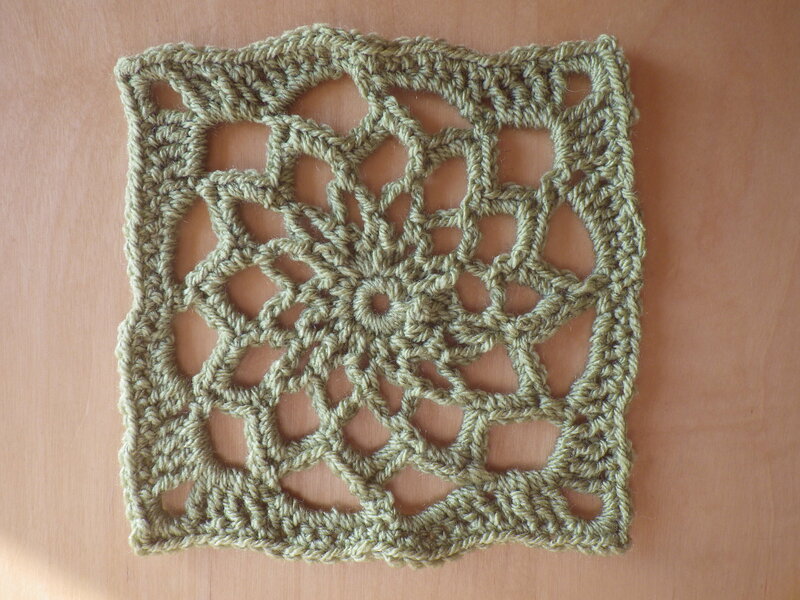 The pattern was inspired by a square I saw on Ravelry, but modified by me. 22 December 2013. I started off intending this to represent the permaculture principle ‘value diversity’ but then I realised it has ‘multiple functions’, including ‘integrate rather than segregate’, ‘use edges’ and ‘produce no waste’. All the yarn used was either left over from other projects or came from Freecycle. 20 December 2013. The design for High Bank involved research about sunflower seeds for eating, In addition, the green yarn that the border is made from is left over from Sissie’s blankie… also at High Bank. 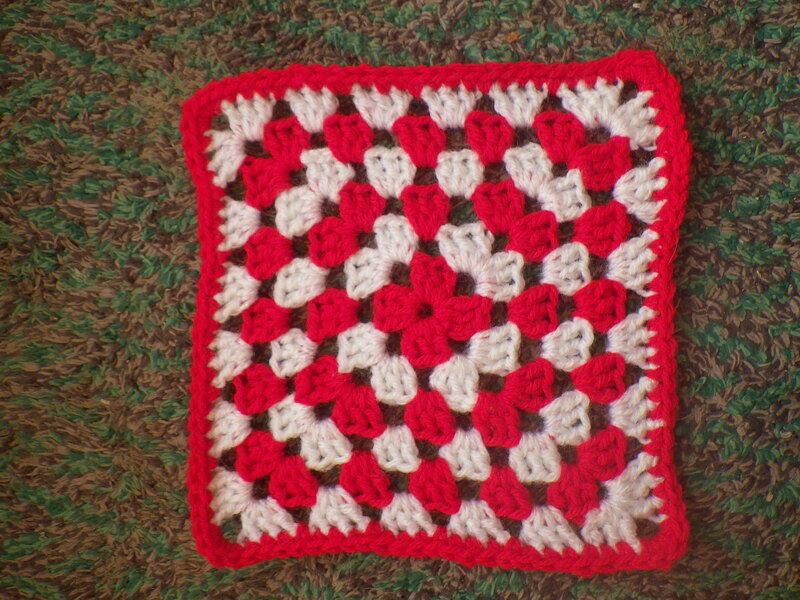 The pattern for the square is from Nandina’s Place and it turned out really straightforward to make! 19 December 2013. Illustrating the permaculture principle: design from patterns to details. 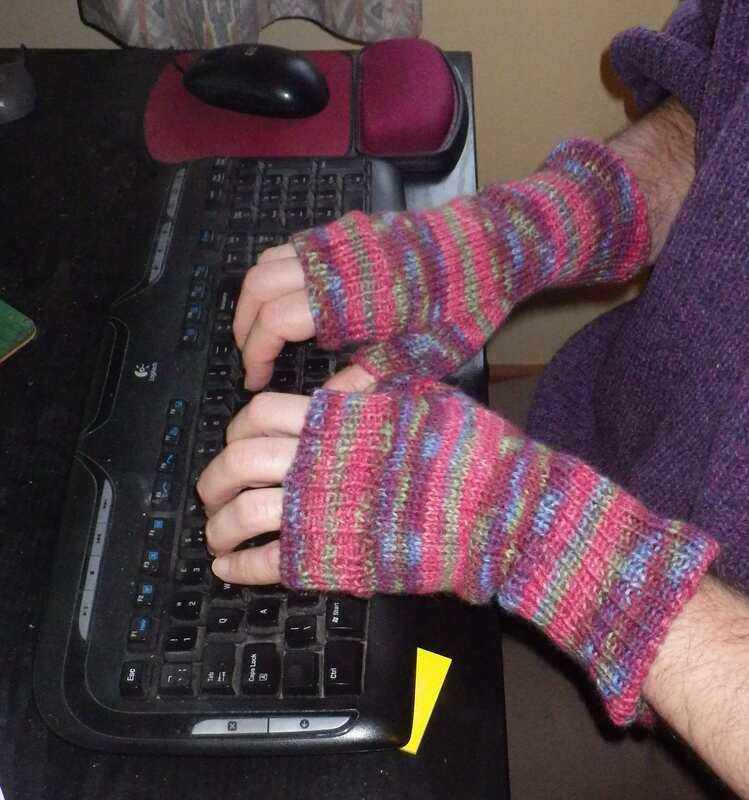 The square is knitted from 6-ply Opal Polarlichter Shade 5207 remaining after completing Mr Snail-of-happiness’ fingerless mittens. I made the pattern up myself: 36 stitches on 3.75mm needles. 19 December 2013. One of the designs in my portfolio related to developing a business called The Snail of Happiness. 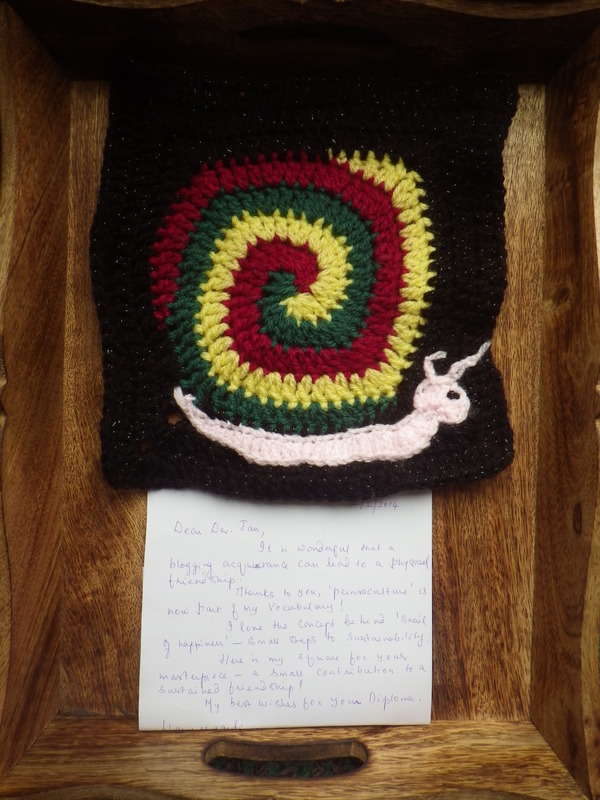 This four-colour spiral is knitted in the same two yarns as the original snails (at the top of the page) as well as some frogged green and cream wools. 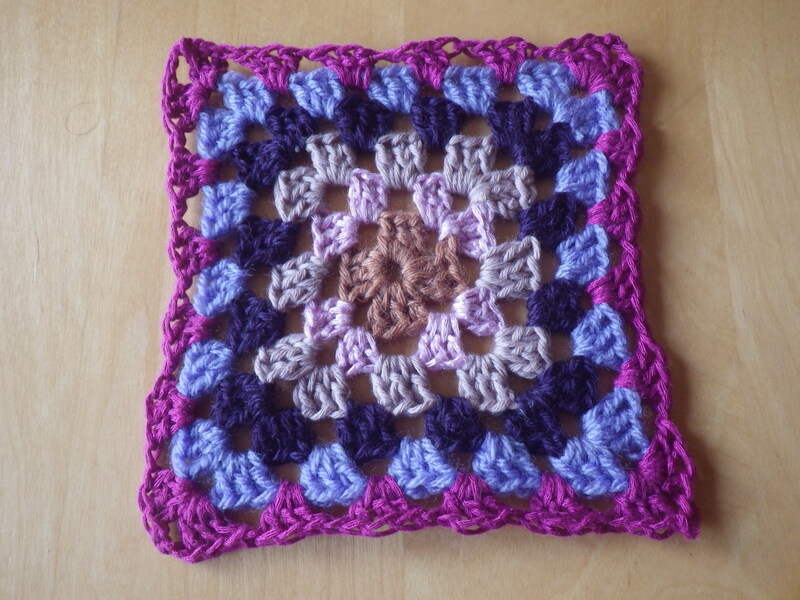 The pattern – Granny Square Twister – was purchased from Elealinda-Design. 18 December 2013. 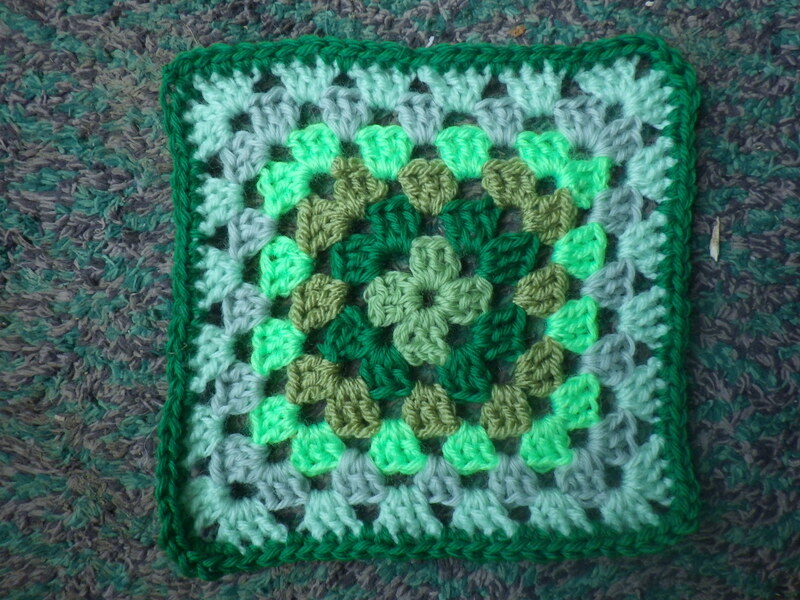 A traditional granny square that was in a bag of yarn given to me by a friend who got it from Freecycle. She only wanted balls of DK yarn and gave me the rest (mainly 4-ply and knitted or crochet squares). This ROYGBIV rainbow square just needed an extra round added for it to be the right size for my masterpiece. 18 December 2013. 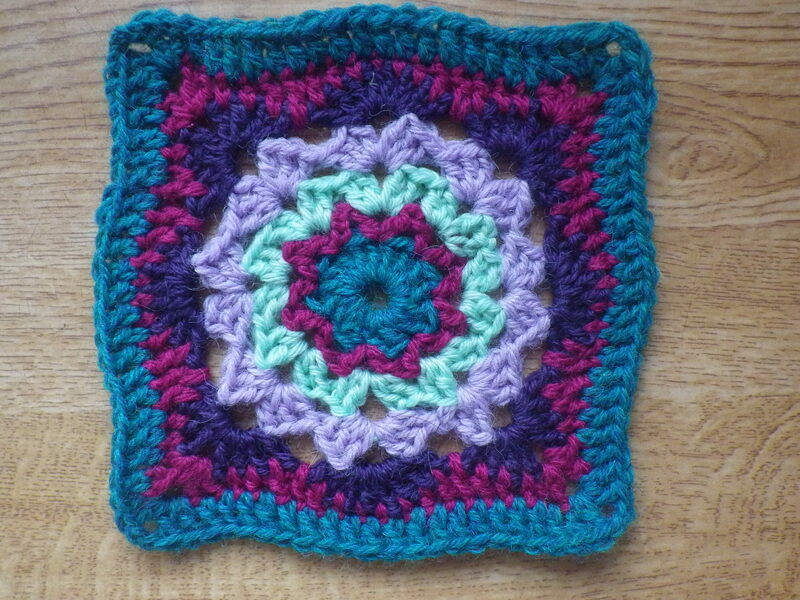 A traditional granny square in yarns discussed in my knitting yarn ethics design. From the inside out, the yarns are: Soya (MMF); Bamboo (MMF); Organic Cotton; Upcycled Wool; Upcycled Acrylic; Bamboo (MMF). 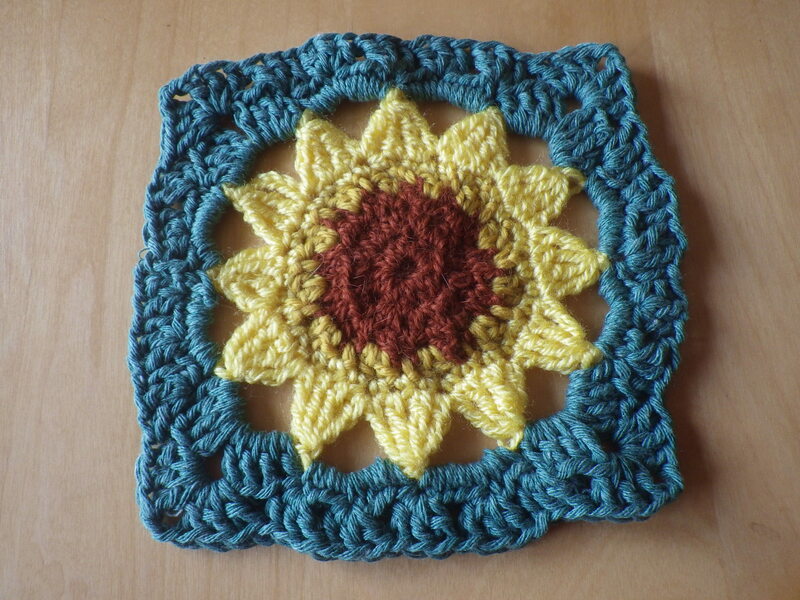 I was really pleased to discover I had a little of the blankie yarn left to enclose the sunflower… I really didn’t plan it! I haven’t done any crocheting in decades. I should find some time to do this. I only learned to crochet a year ago and have really been enjoying it. It’s such a contrast to knitting somehow. 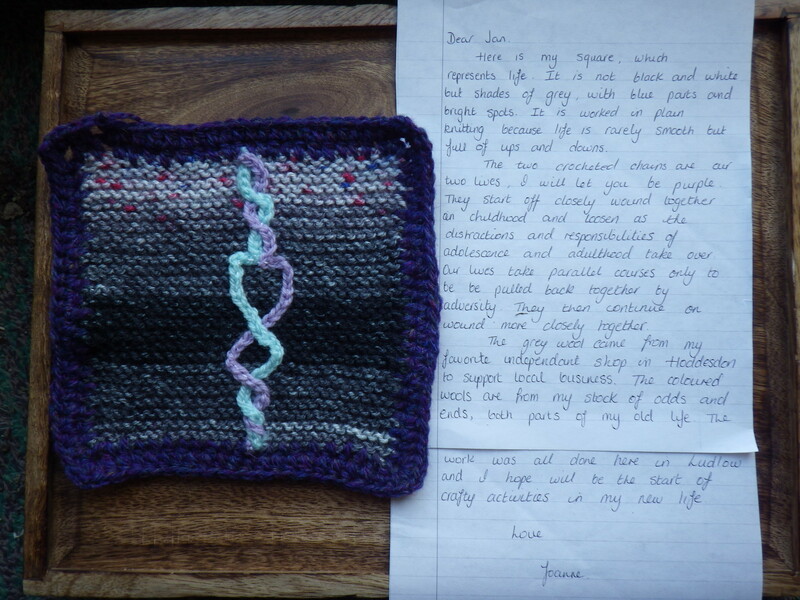 If you would like to contribute, I would be delighted – knitting or crochet! Such wonderful colours. They radiate warmth. They are lovely. Hopefully when they are all stitched together there will be an absolute riot of colour. First time I’ve visited your blog, I’ve come via Tales from Chiconia. Your idea for a masterpiece blanket made from friendship squares intrigued me and caught my imagination….I’d like to contribute, if I may? I haven’t looked further back in your posts to see if there you have any particular requirements ….I see most are symbolic in some way. I’m sure I could come up with something. Alright, thankyou. I’ve read the original post so now I can start percolating some ideas. I look forward to it… thank you again! Love your permaculture principle idea for the blanket. It reminds me, that I owe you one 🙂 okay, let me make it first and you can tell me how to get it across to you. Lovely… just e-mail me when it’s done… address on the right. Thank you – it’s turning out to be a fantastic project. I have e-mailed you. Oooh – thank you… it’s always so exciting when I know one is being created. No, that’s fine… every square has a border so that I can make appropriate adjustments… yours will just have a thinner edging… thank you.. have I sent you my address? E-mail sent… let me know if you don’t receive it! Thank you… really must update this, there are many more squares to add! Thank you… as well as the squares I made, about 50 of them are from friends locally and around the world… it wouldn’t be half as diverse without them! Thank you… I’ve put a link you might like in the comments on your ‘About’ page. I did not know you then, so I’m so happy you’ve included these links. What a remarkable project and once again, I’m gobsmacked by the generosity and creativity of our fellow bloggers. This is an inspired project, so incredibly unique and wonderful. My spirits are lifted just reading this. We had a fantastic few months – my postie was fascinated by all the little parcels from around the world – it was like having a six-month birthday. What fun…for both of you. We’re on a postal training route, so our delivery person varies constantly. I never know who’ll deliver our mail, or when. Lately it comes after dark which is quite strange. But…the mail gets here, quite reliably, though one or two things go astray. We’ve had the same postie – Henry – since we moved here at the end of 1999. He’s kind and looks out for people and he always knows what the weather’s going to do! I like Henry already and we’ve never met. What a fun way to stay connected within your community. I’m happy for all of the souls on Henry’s route. Please tell him Alys says hello from California. Friends, Indeed: Kit, Liz, Jan | Love Those "Hands at Home"